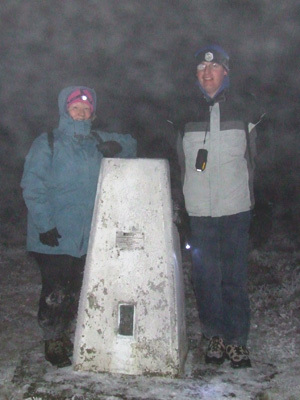 There are 103 photos for this trigpoint (view album). 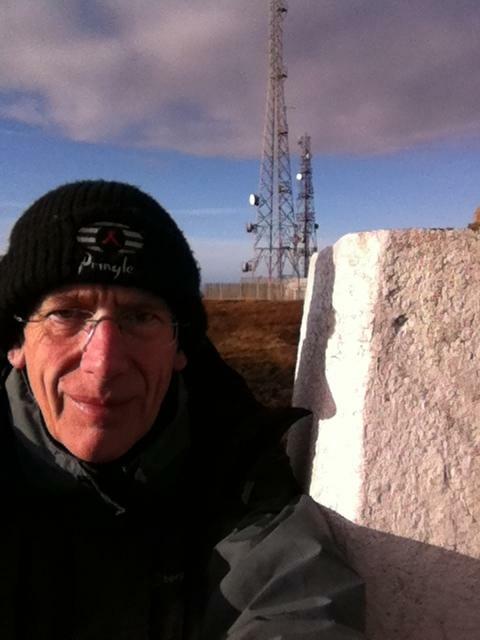 Is ranked joint 1902nd with 17 other trigs (more). See 95 more in the album. windy afternoon but dry and bright. fantastic views today. 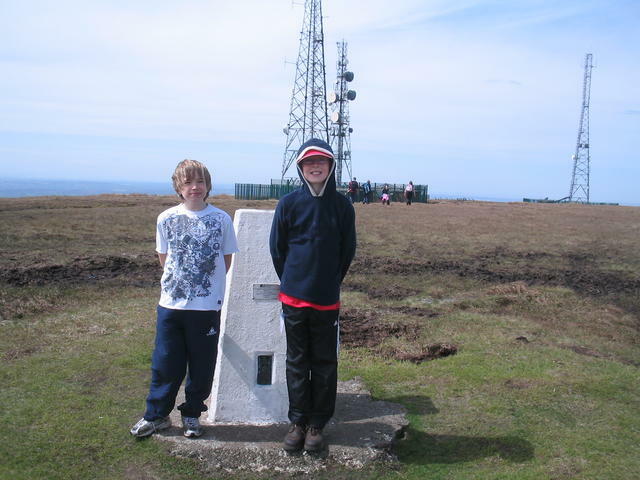 Walked from Wilderswood car park up to the tallest transmitting station in the U.K & onto the trig point & back via the 2 lads & cairn. Good parking spot in Layby at Hordern Stoops. 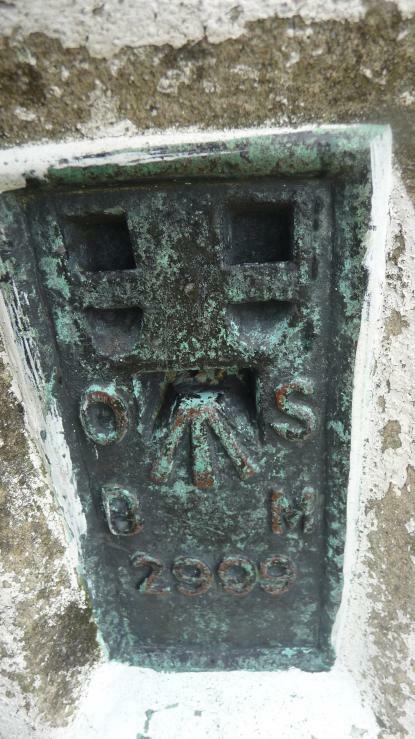 Headed South up the well defined path and a fair bit boggy today after the snow melt, found myself walking on top of I guess the one time boundary wall that now seems to be the path on wet days ! Muddy ascent up final pitch to the summit to be greeted by not one mast but an abundance of masts. not enough fingers to count them all. 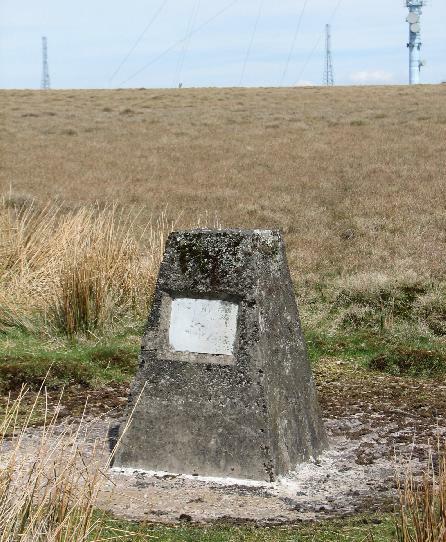 Threading my way past metalwork eventually found the trig - bit wet and boggy from recent lying snow. Pillar with weathered white coat of paint and adorned with Red Rose. third of the day with RROL. 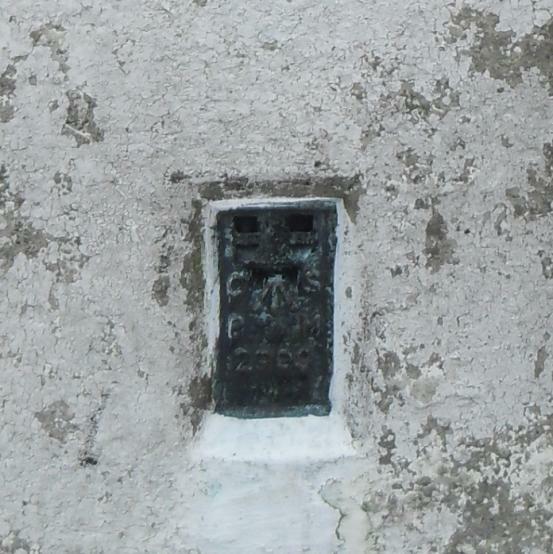 Plug removed and filled otherwise all metal on pillar intact. 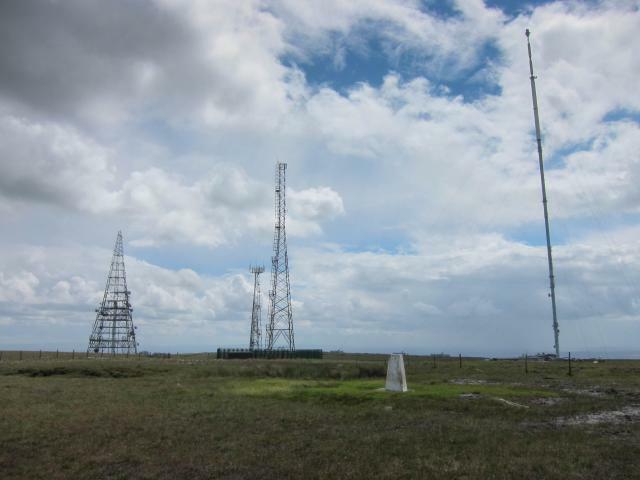 Views to N & NE uninterrupted by the array of masts. 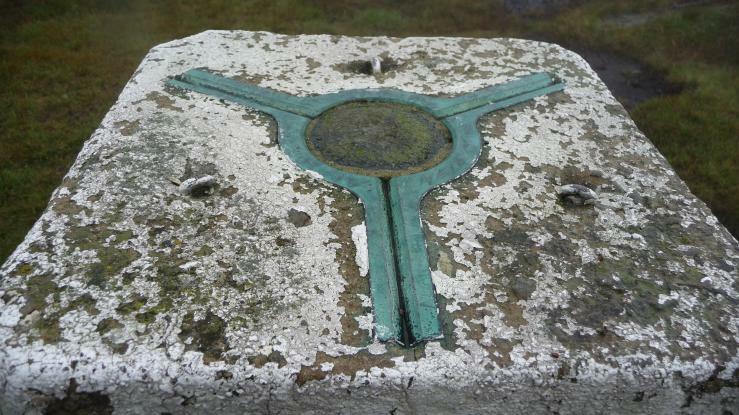 I imagine this to have been a great view point pre mast era.. best view from top of TV Arial now. 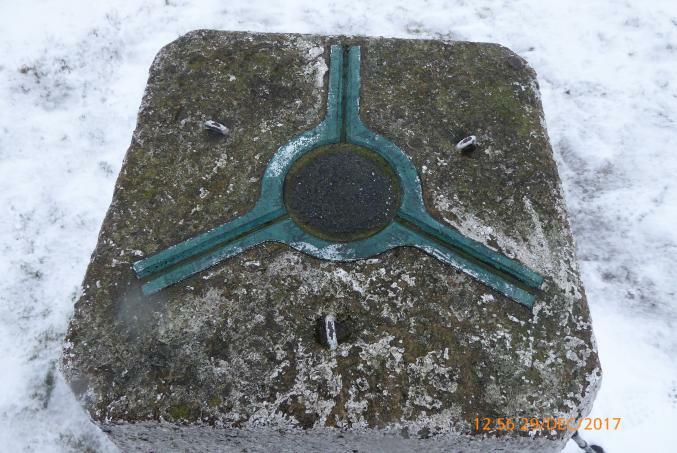 Walked up in the snow from Hordern Stoops. 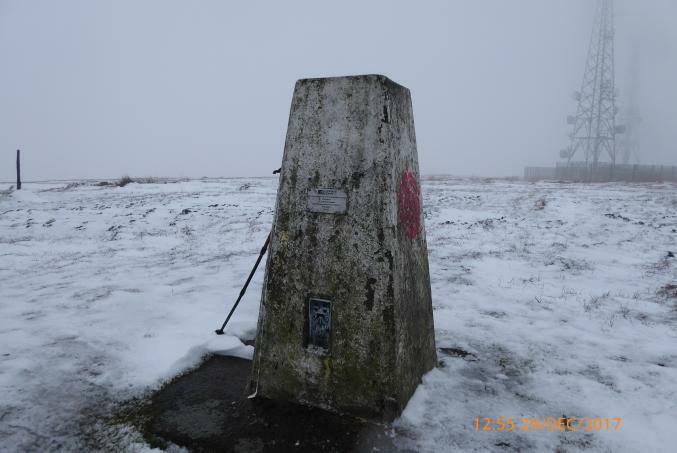 Pretty desolate up here in snow and with the cloud down. No-one around. 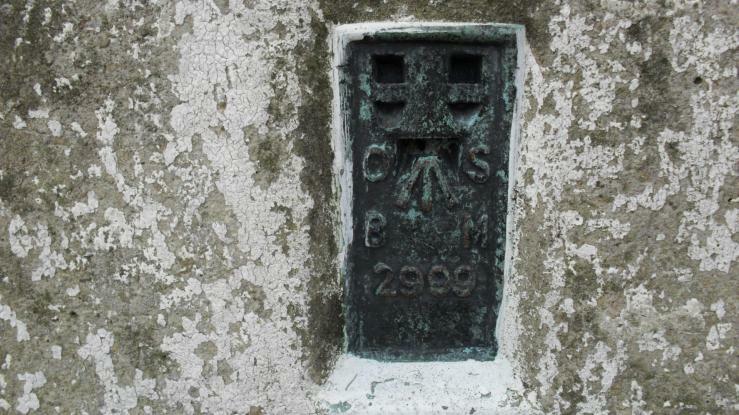 Pillar has a red rose stencilled on 3 sides; top cap missing, asphalt plug; rear sight hole open. Very low cloud giving no views and not much viz. 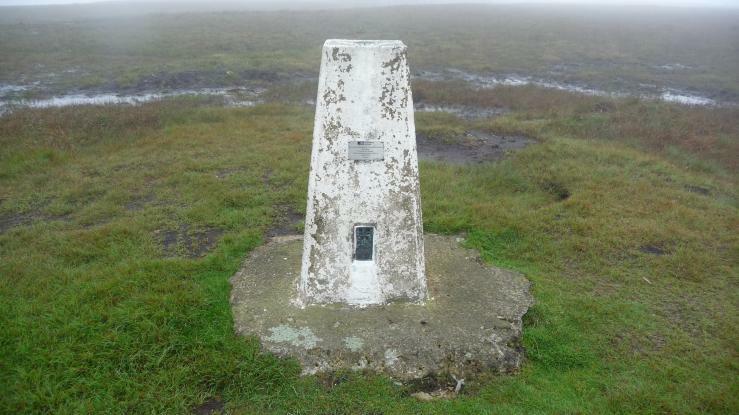 Started this walk near Barrow Bridge chimney, up the 63 steps and onto the moor. 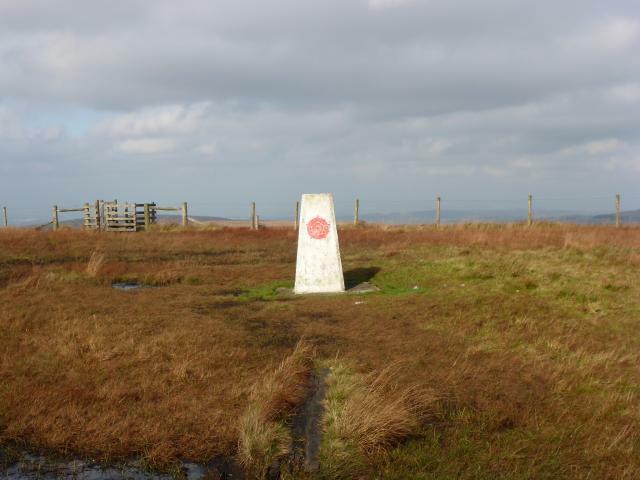 This was West Pennine Moors at its best. 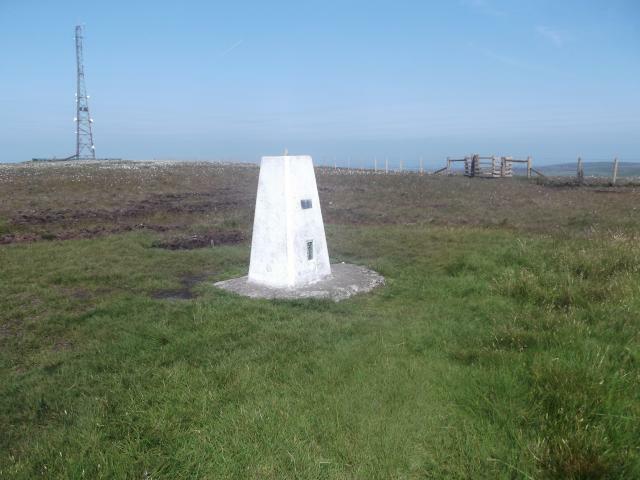 A lovely sunny day and a clear objective of the Winter Hill furniture.No 3 of my project to photograph the Lancs Agrics class of '79 next to their local trigs, so thanks Jonathon for a great walk. Keeping my tradition of allowing myself a repeat bag once a year - back to this one visited before it got it's rose back on 10/1/15, just realised it lacks the "S". First one I logged, up this time from S4488. Up from Hordern Stoops. 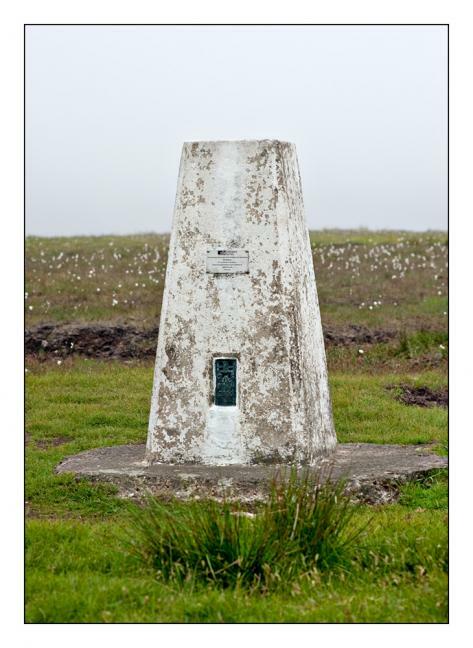 Assumed this would be called Winter Hill, but seemingly not. 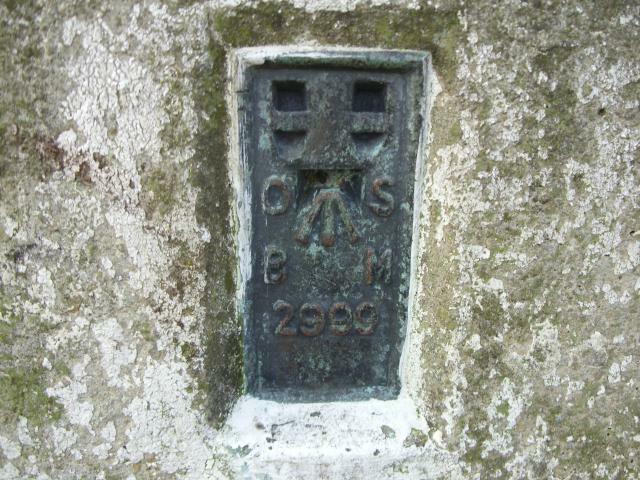 Steep climb from car park to the west. 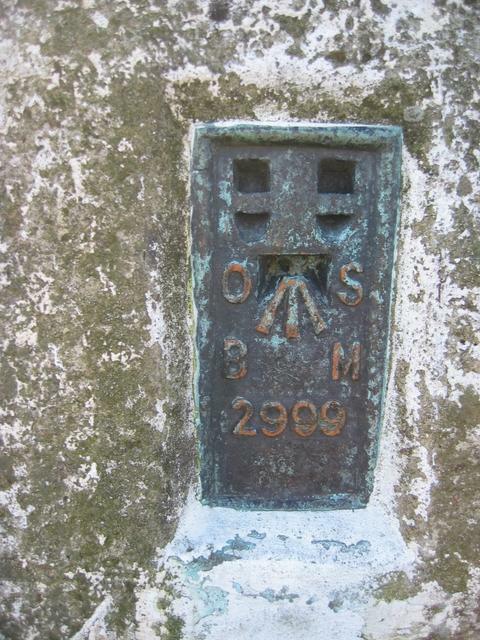 Once on top steady walk to the pillar. very misty/cloudy with rain at times. 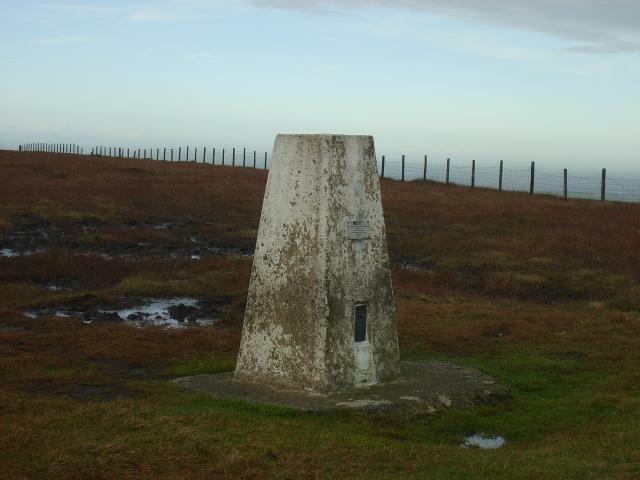 Pillar in good condition but views limited today due to weather. 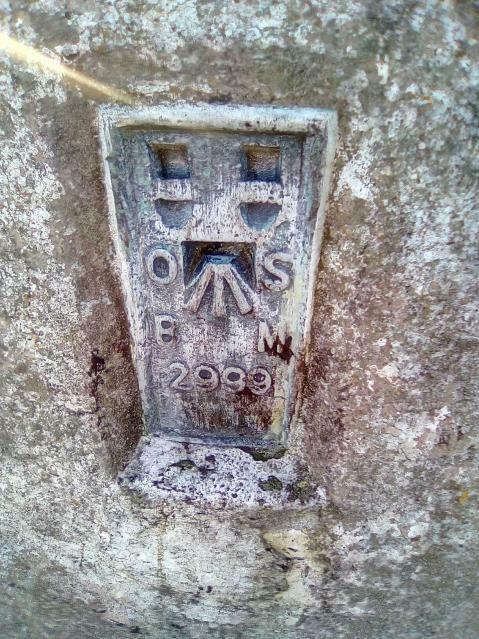 Easy walk up from Wilderswood car park, past the mast and up off to the left after Scotsman's Stump. 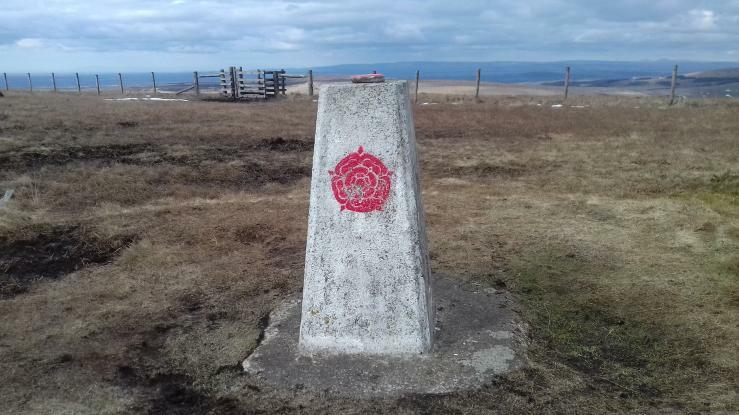 Great looking trig with the red rose stencils. Easy to find and excellent views to be had. 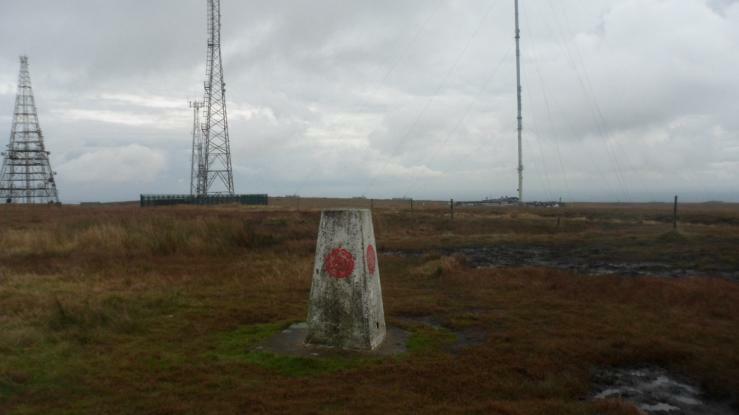 Revisit up from horden stoops trigs repaint looking dull now misty not much view. 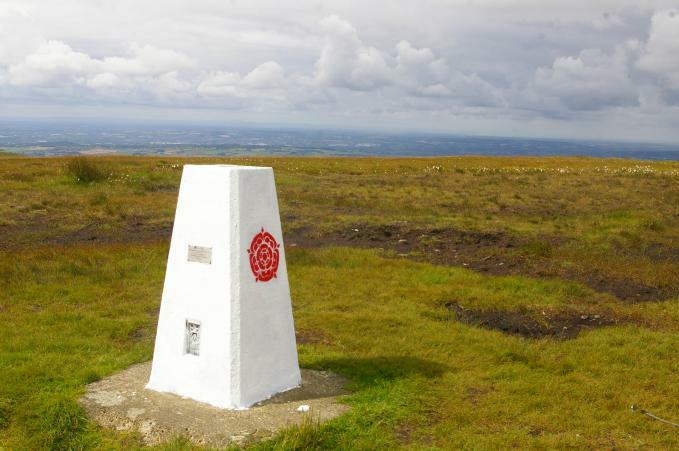 Great views from the top of Winter Hill - circular walk talking in the Pike and Pigeon Tower. 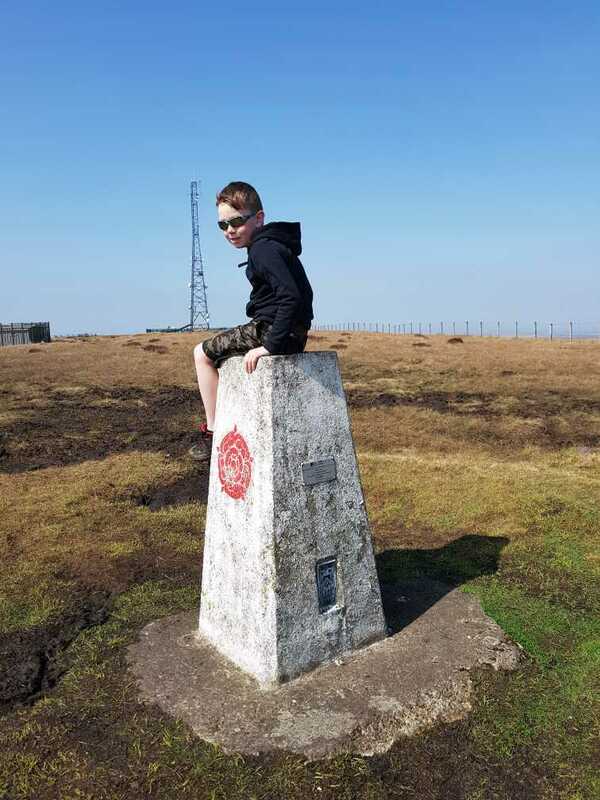 Walked up from Rivington Hall Barn with my son, lovely walk on a bitterly cold day. 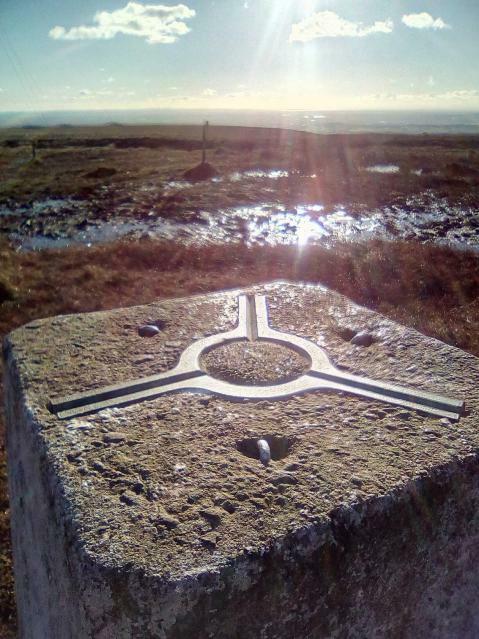 From small car park at high point of road to the North. 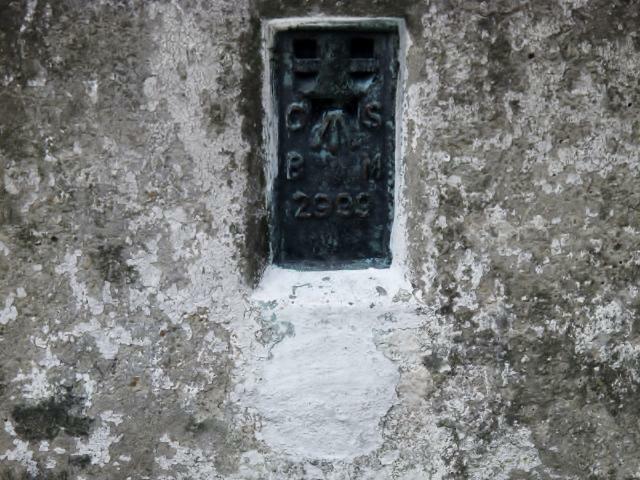 HISTORY: Pillar completed 26th March 1936 cost not on record. 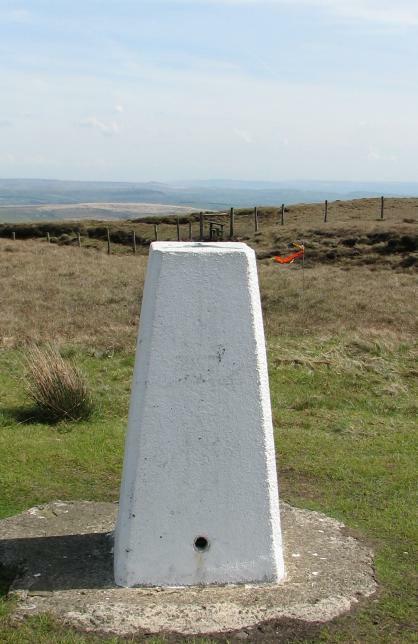 Computed as primary triangulation station PP20 within Figure 2 of the OSGB retriangulation during 1936. 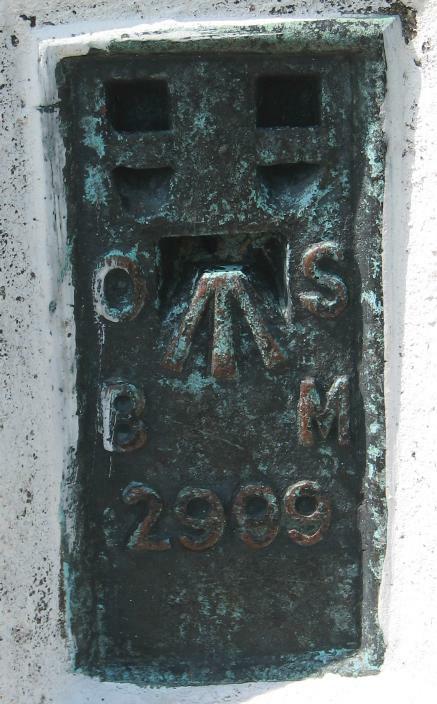 Levelled for height in 1963. 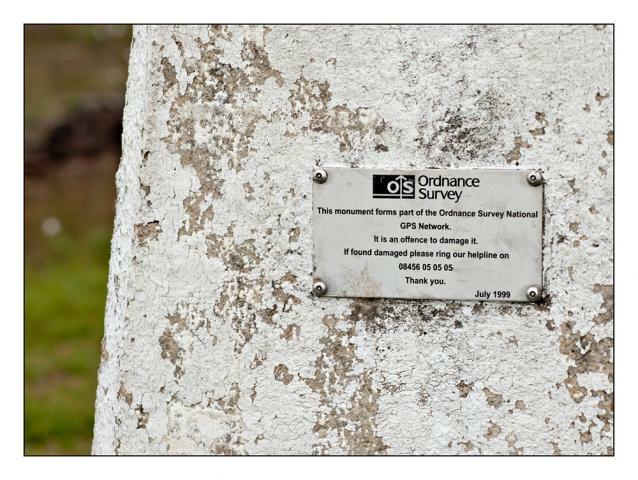 Continues to be maintained by the OS as a GPS passive station. SITE VISIT: Approached from NNW. Parking area to north side of Rivington Road at SD655158, and in wide entrance of Belmont Road at SD653157. 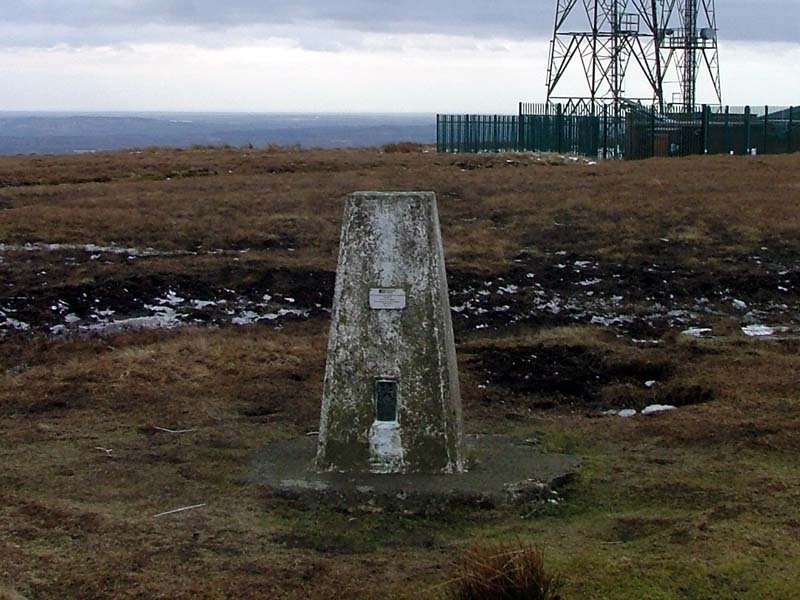 Direct route via unmapped path which follows the Local Authority boundary line to the summit of Winter Hill. 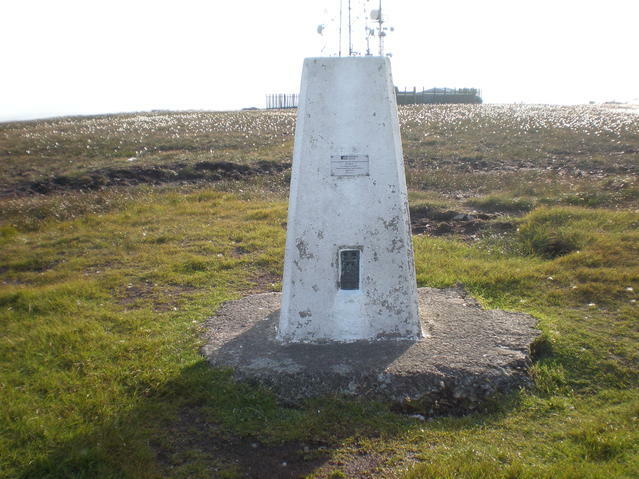 White painted pillar in good condition. GPS plate affixed on FB face while an red English rose is painted on all three other faces. Spider centre plugged with tar. 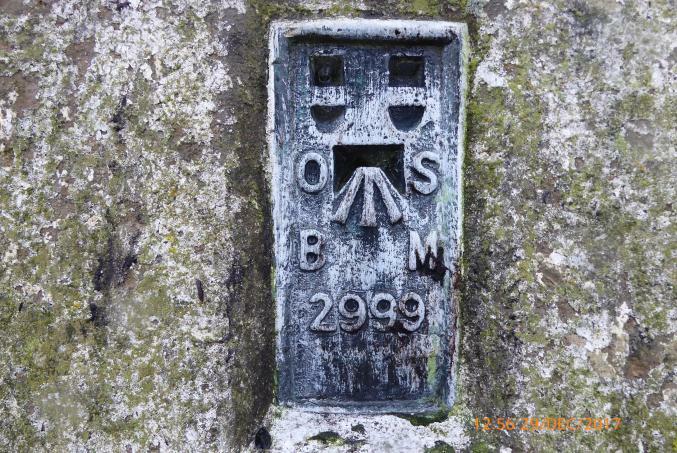 Flush bracket faces east, ~92�. Vented through west sight hole. 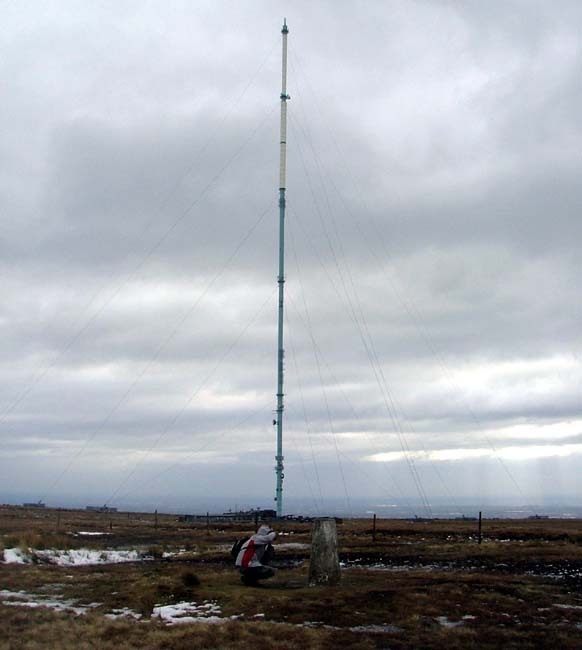 Full 360� panoramic view interlaced by around eight different comms masts. 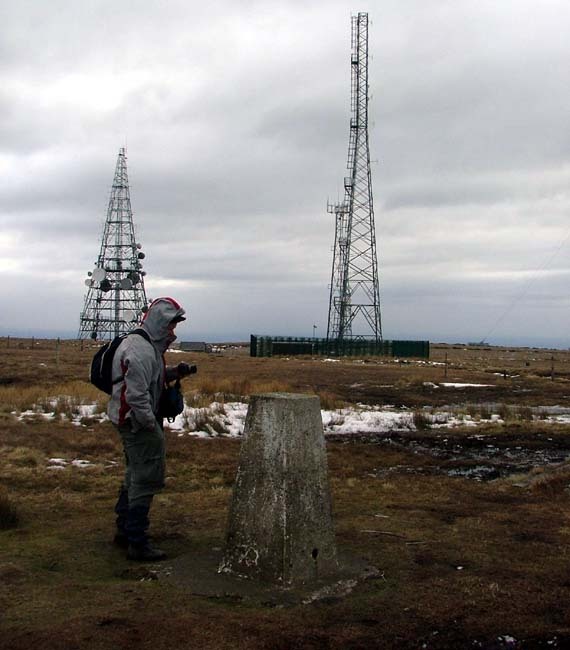 I had thought of using the access road to the comms installation. 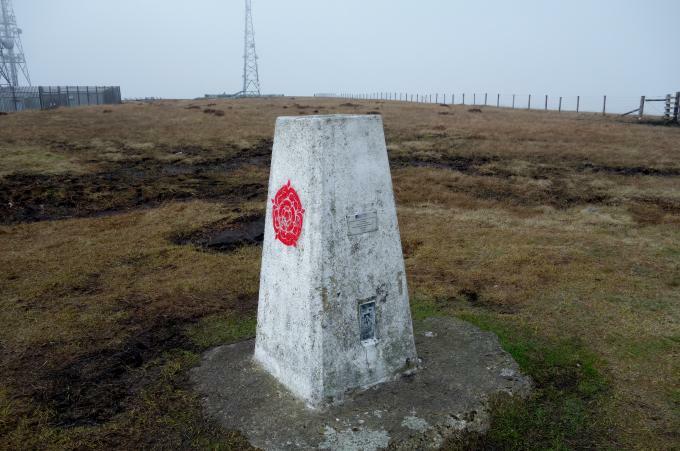 However, in cycling from Belmont toward Rivington I spotted the permissive path from the summit parking area and decided to walk this. 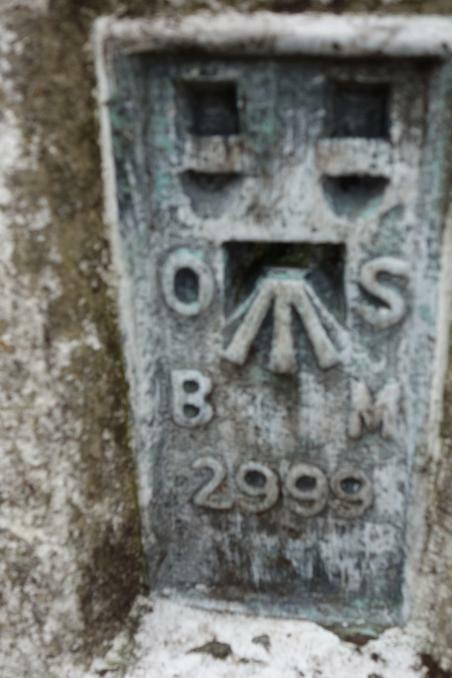 Rather wet in places, filling shoes more than once, and a brutally steep last climb to the top. 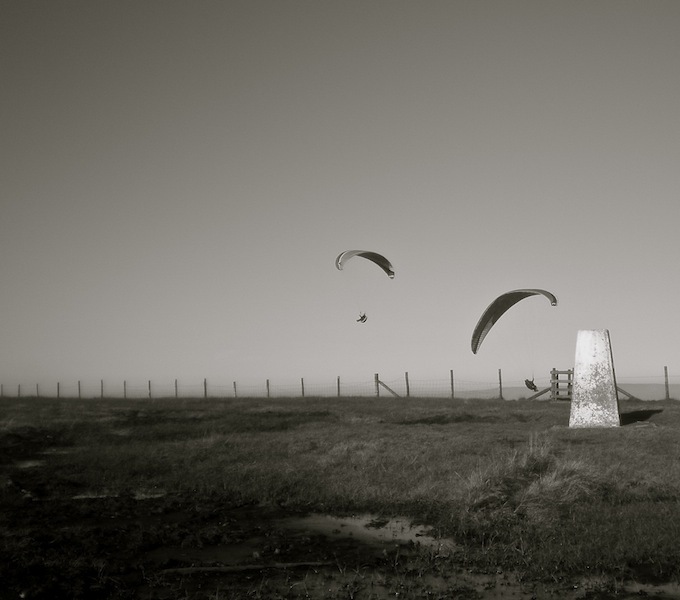 Despite the warm sunny day, the views disappeared into a grey haze. 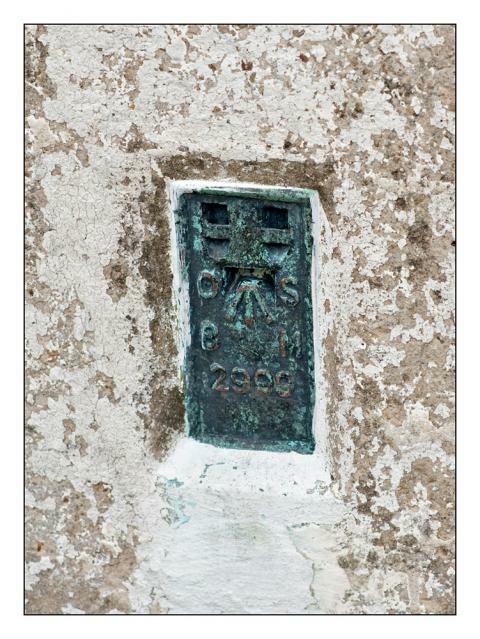 Fifth pillar of the day and reaching a grand total of 2650. 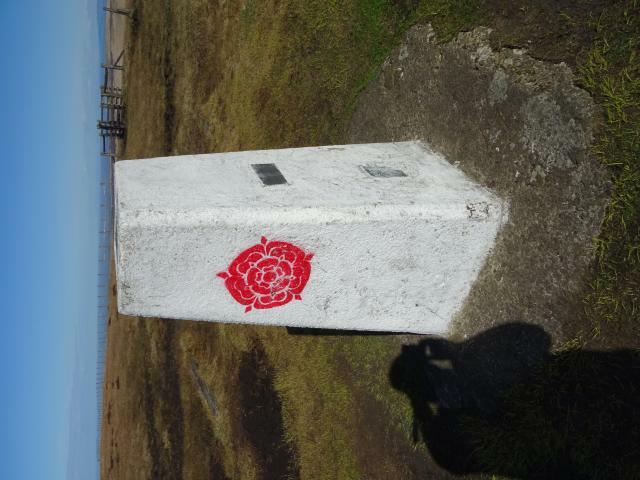 Lovely whitewashed pillar sporting the red rose of Lancashire, cap filled and a smidge off being properly upright with only the western sight open. 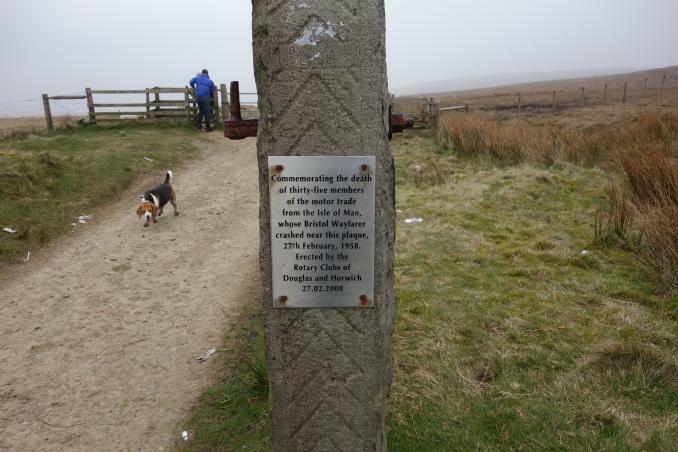 Cool we saunter up the access road with lots of boggy mud around the pillar itself. 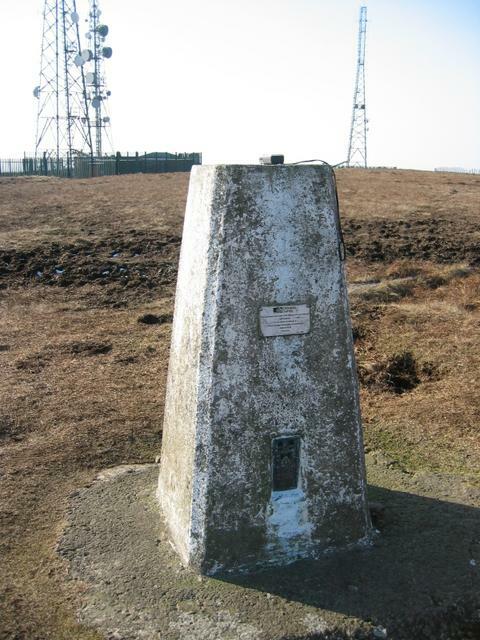 Rivington ..a smidge off truly upright. 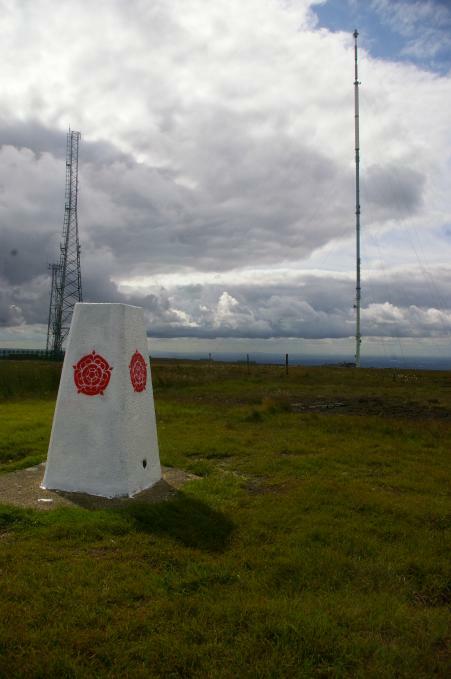 From Rivington Pike on a generally sunny, but breezy day. Good all round views. Bright white, adorned with a Lancashire red rose. 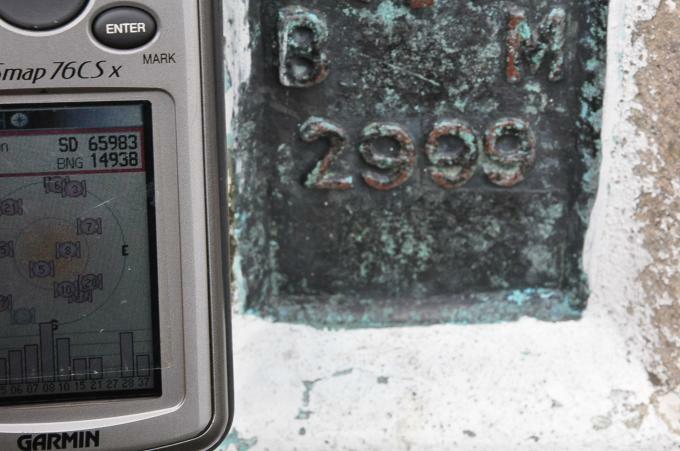 Interesting area to visit. Walked up from Levens Park on one of the finest days of the summer. First walk after a New Year flu - taking it easy! 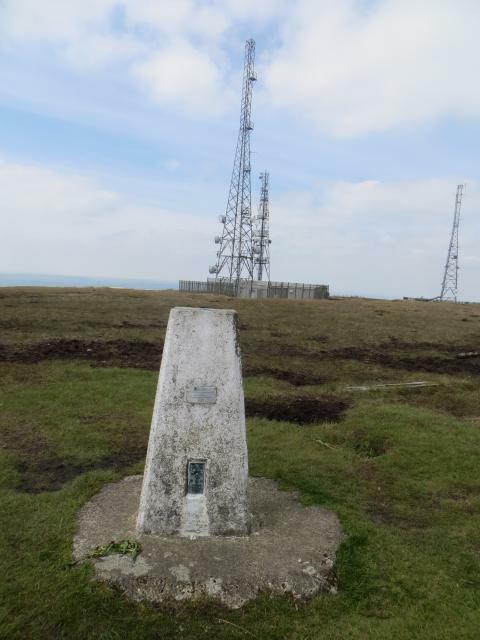 After a flying visit to Chorley with my non-caching brother, being so close to Winter Hill, and the impressive feature that I have wanted to visit for a long time, I just had to go. 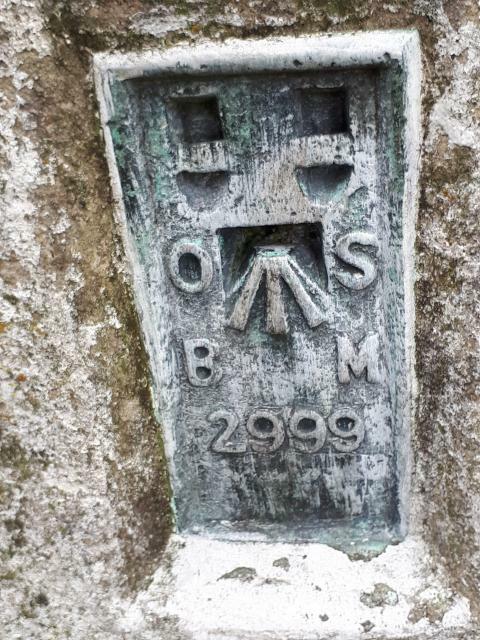 Unfortunately today, the visibility wasn't good, as we progressed up the hill, it lessened, by the time we reached summit it was reduced to a mere 20/30 meters. 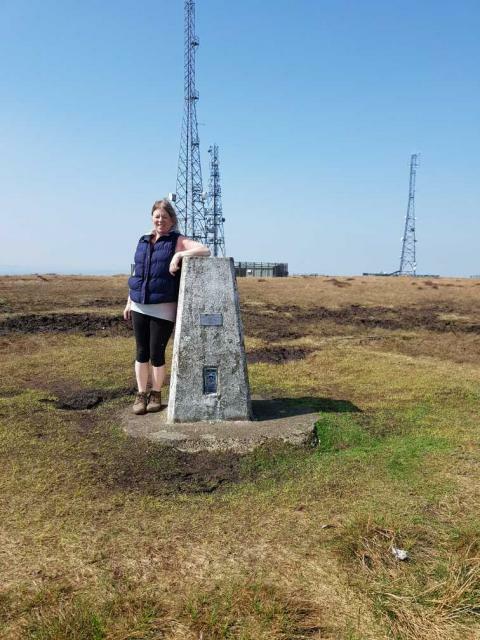 Having made our way up from the lay-by on Rivington road, and being this time of the year, it was quite tough going, we arrived at the summit where there was a lovely clean tarmacadam road. 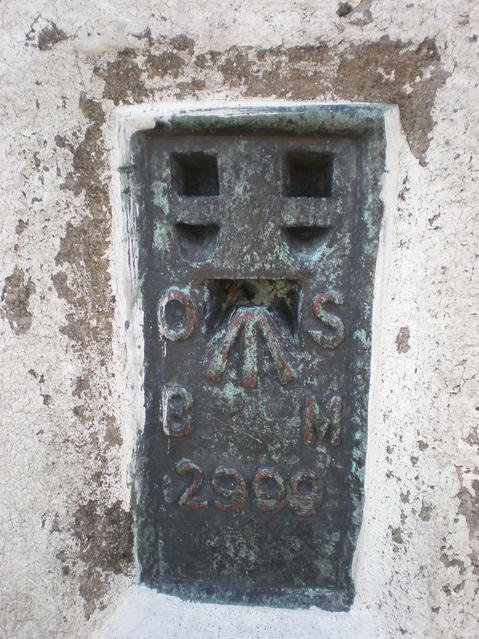 Then after a little chat to two men, who were sheltering from the wind, we continued to the pillar. 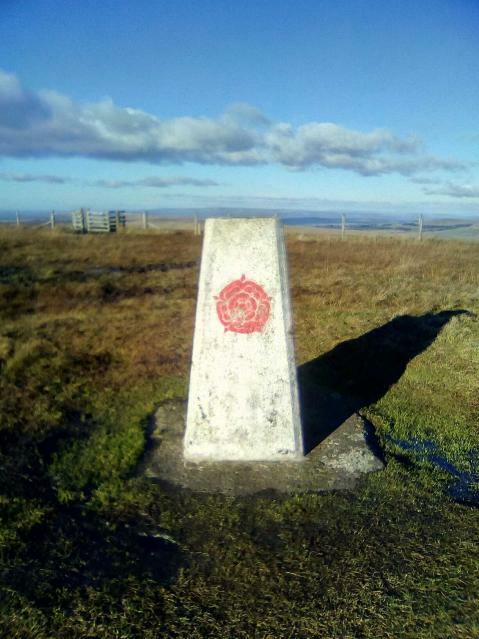 7 mile circular over Rivington Pike and onto Winter Hill, perfectly clear and sunny, could see Blackpool Tower from top, onto Cheetham Close (Druidical Circle) trig and Darwen Moor trig. 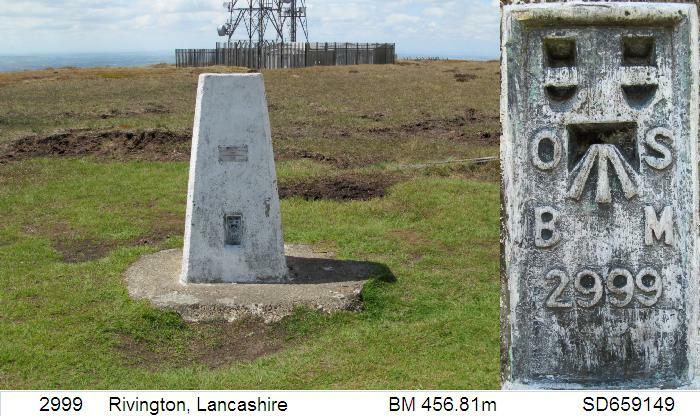 Bike ride from boat at Adlington then walk up through terraced gardens and Rivington Pike, over to Two Lads, trig then back down Noon Hill. 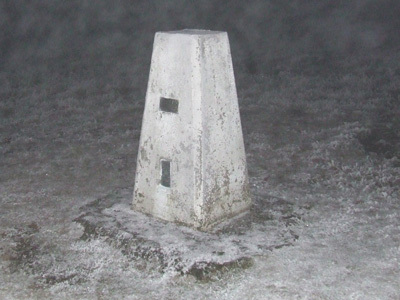 It may be March, but it was freezing cold up with dense hill fog and blowing a minor gale. Hill was living up to its name in terms of temperature anyway today. 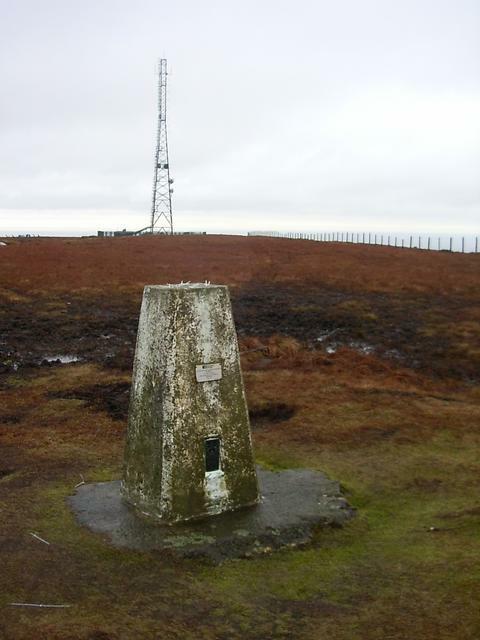 Lovely walk up Winter Hill today. 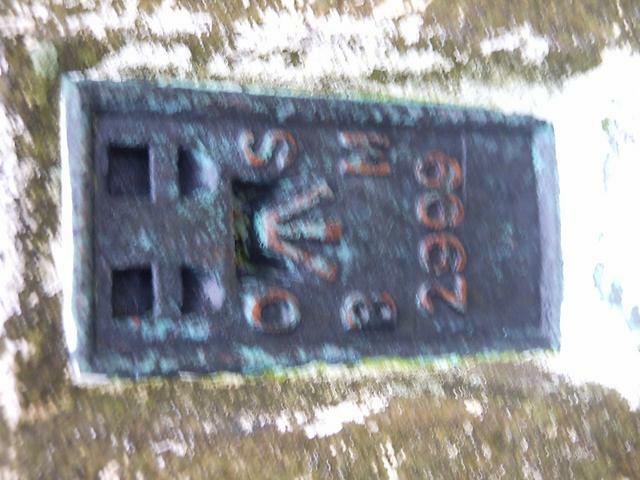 Parked at lay-by on Rivington Rd and walked up broken down wall. Nice flat top with good views and plenty of masts around Nice warm day. 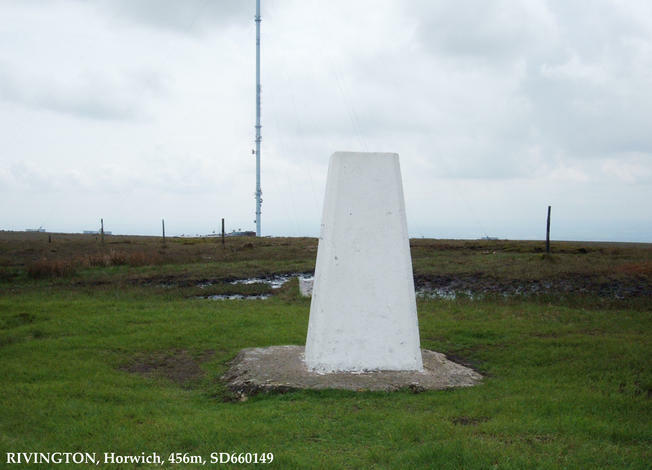 Circular walk from Horwich taking in Rivington Pike & Winter Hill. Nice sunny day. 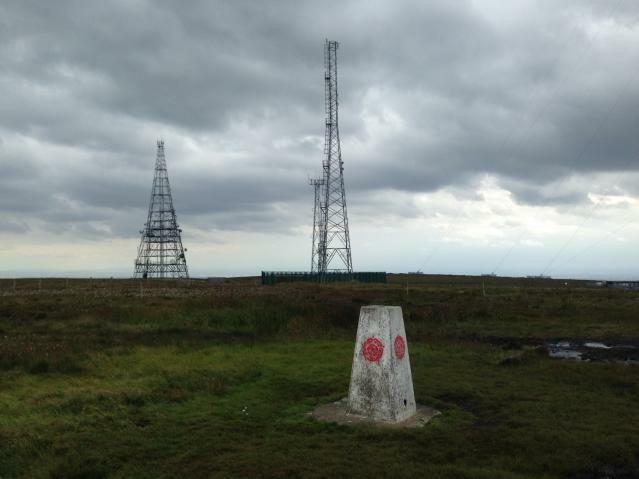 Walked over from Rivington pike, then along the access road past all the masts. Aside from these the views are great. 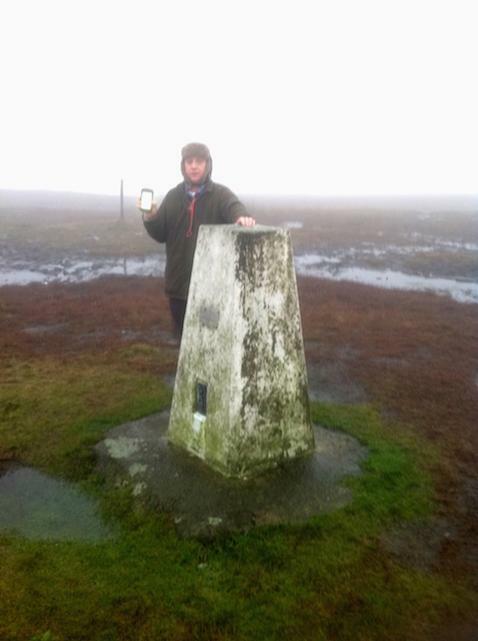 Still raining and low cloud,still no view to be seen. Good views if you look past the radiomasts. 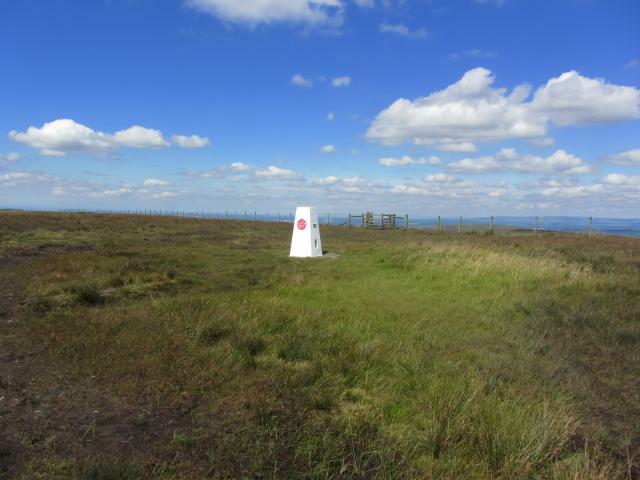 The area is rough heather moor but 2 meter or so around the pillar is very green grass. Asphalt plug. Public. Access Land. 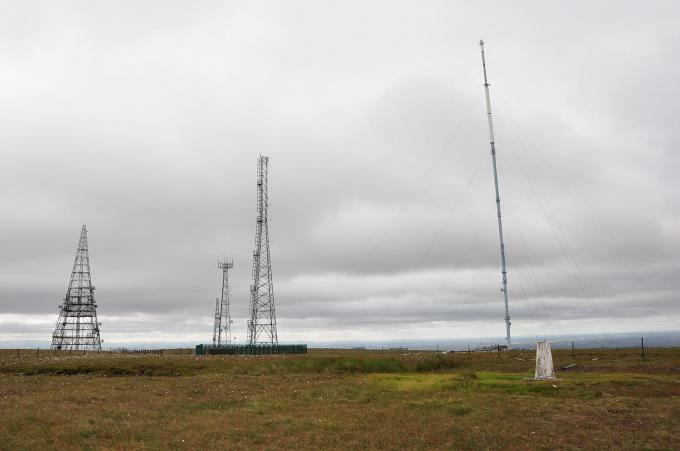 The lofty summit of Winter Hill is quite a spectacular location, an obvious site for a trig pillar [plus numerous masts]. 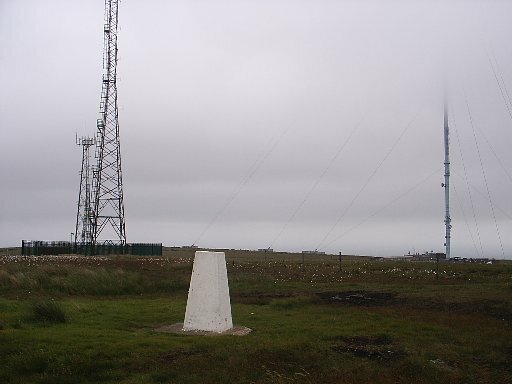 Good path up from SE, but there are many other ways up, including the access road to the masts. 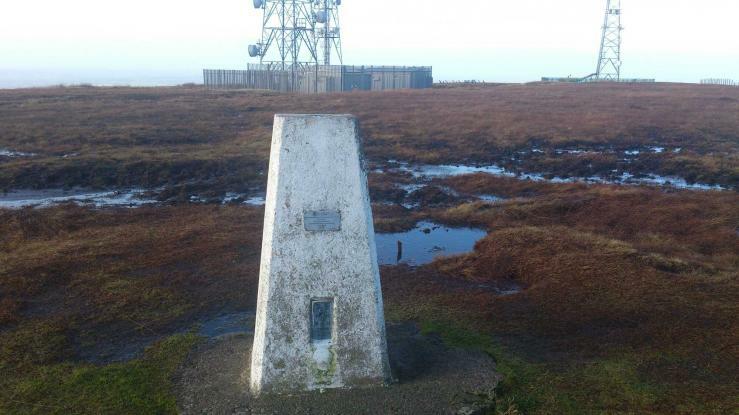 The summit itself is on the boggy side. 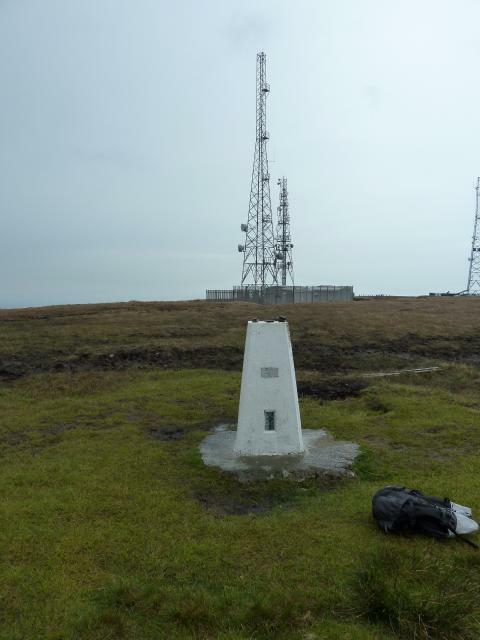 I was clearing a fault at a very nearby BT radio station,so a 2 min walk away,trig was in the bag.Trig in good nick,fading white paint,resin type plug and 1 sight hole open.good views,but quite cloudy and very windy,but can't complain as I virtually drove to trig! 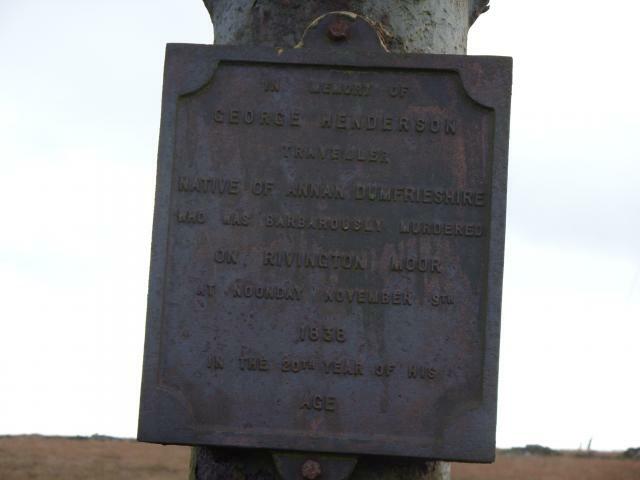 !Also,by the main tv mast,at side of road,is a plaque to George Henderson,who was barbarously murdered in 1838. A joy - delightful weather, bit hazey. 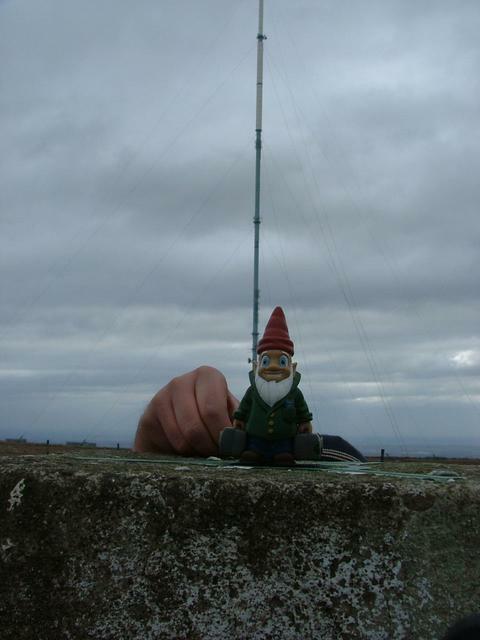 Bagged along with Hordern Stoops and a couple of caches on Winter Hill. Great views. 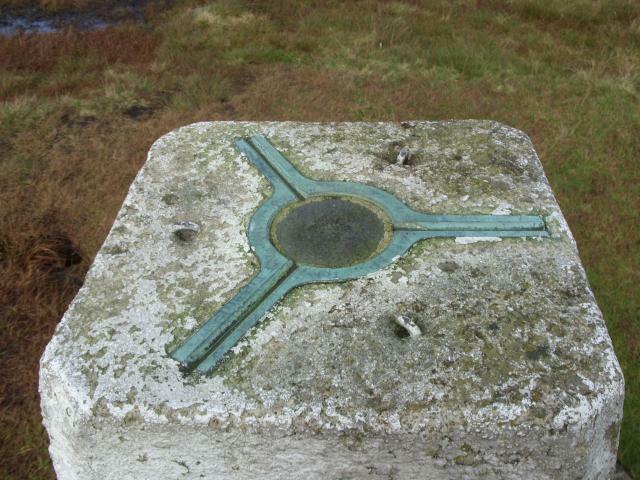 Waled up from Rivington on a 10 mile circular walk. Bit misty today but surprisingly mild for January. 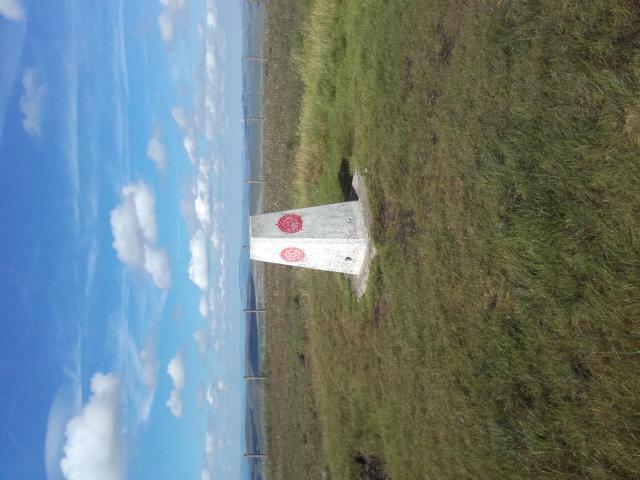 I parked at the Surface Block at Horden Stoops and walked/scrambled up - Amazing views to Wales Blackpool and the Lakes - Pillar good condition. 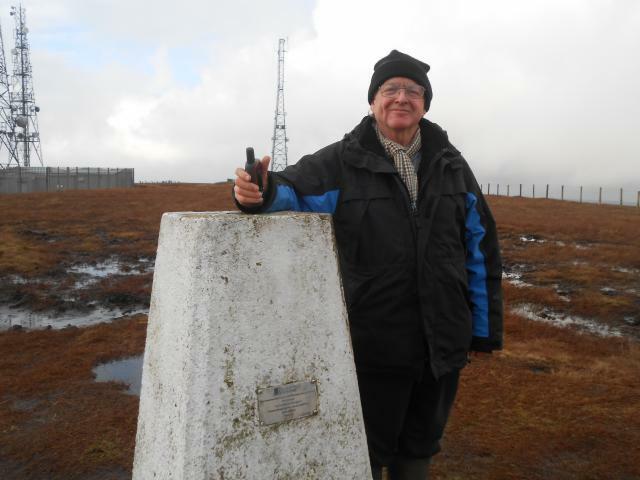 Up from Rivington Road/Belmont Road nice up hill walk windy but dry with great views all round. 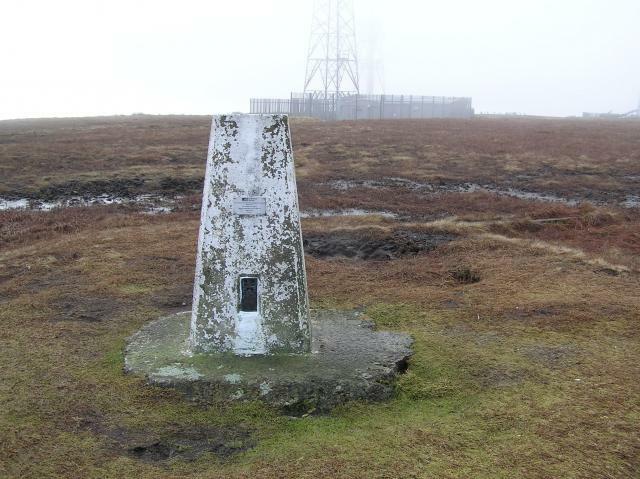 A misty day with only the top of the TV mast visible. 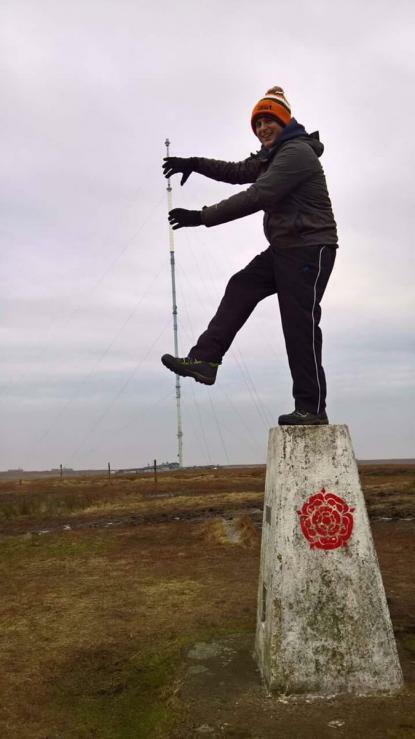 I also parked at Wilderswood car park and walked north west from there first to the cains adn then onto the masts, taking in the county tops on the way. 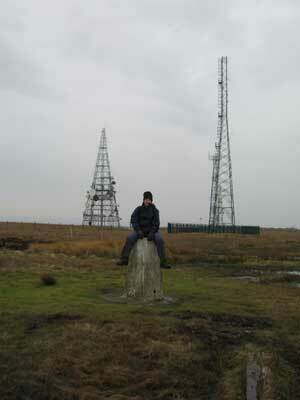 In amongst all the masts is a memorial to Donald Henderson who was murdered here in the 1930s. 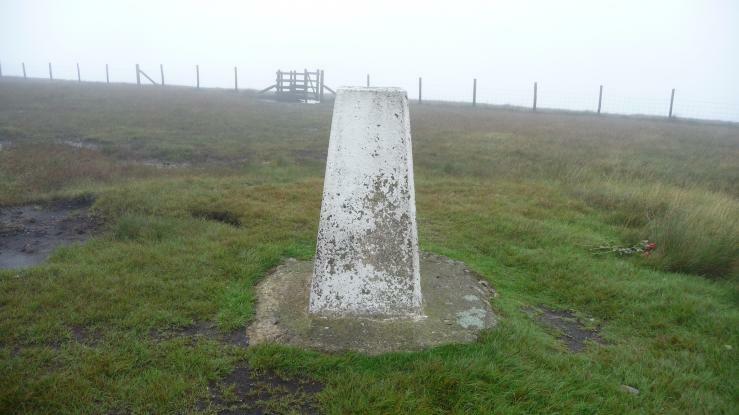 The trig looks in good condition. 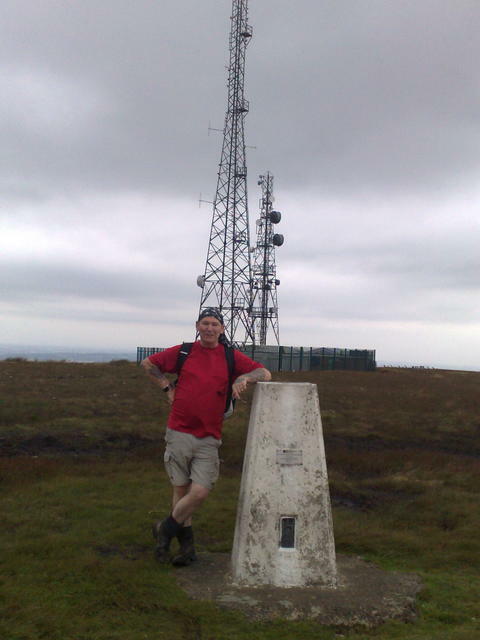 Lazy day drove all the way up to the trig Yes all you Ramblers get a car ! 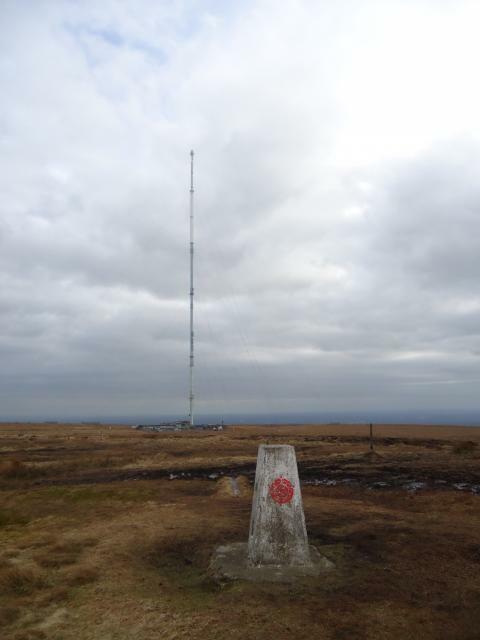 Walked up from Wilderswood car park.Pleasant walk in wintery conditions passing tallest mast I have ever seen on winter hill.Excellent views from pillar. 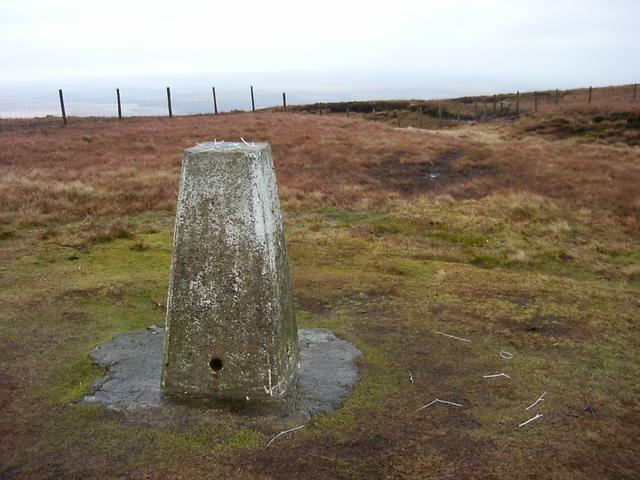 Excellent views from Trig Point on Winter Hill. 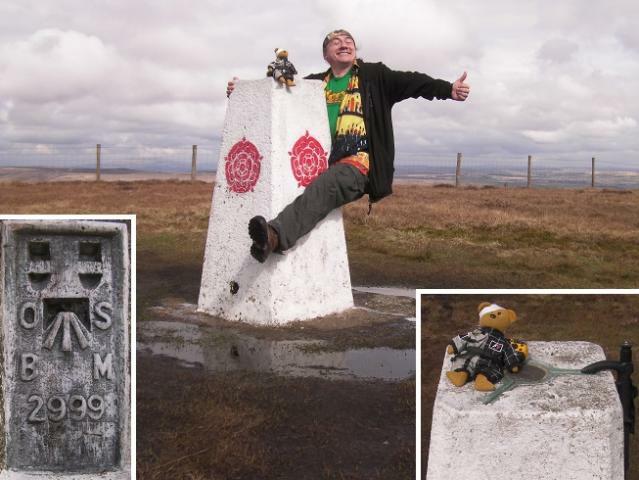 Visited whilst on the Winter (Hill) Solstice Geocaching event walk. 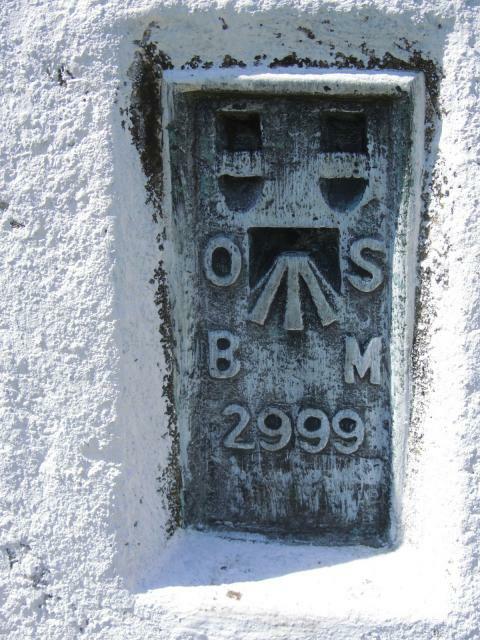 Visited in the dark and freezing fog, so no views to speak of today, but still a very interesting visit! 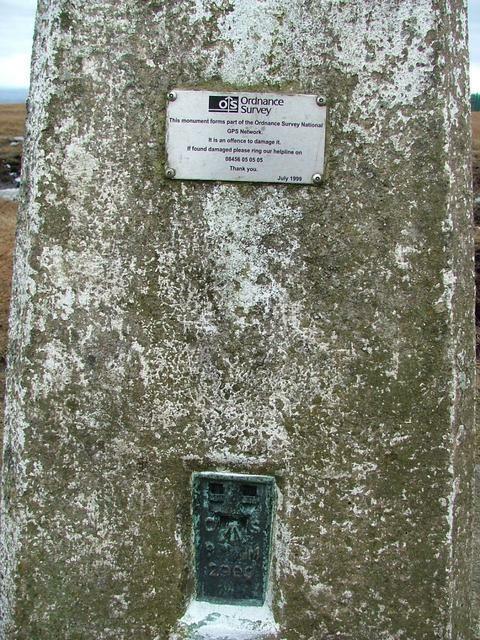 Very cold day long trudge over boggy moorland,top has many massive arials trig has OS plaque. 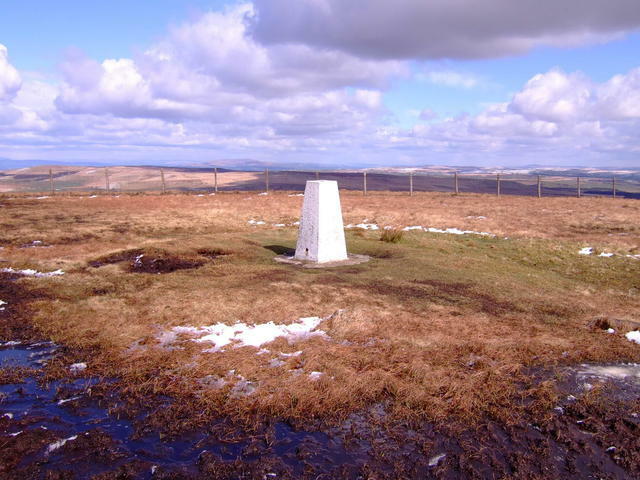 Great walk up here today from Noon Hill while out geocaching. 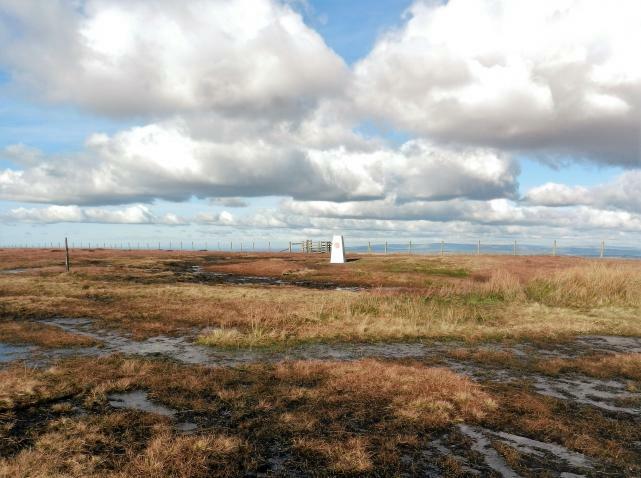 Rather isolated in the middle of a gooey black swamp, but otherwise in good condition. 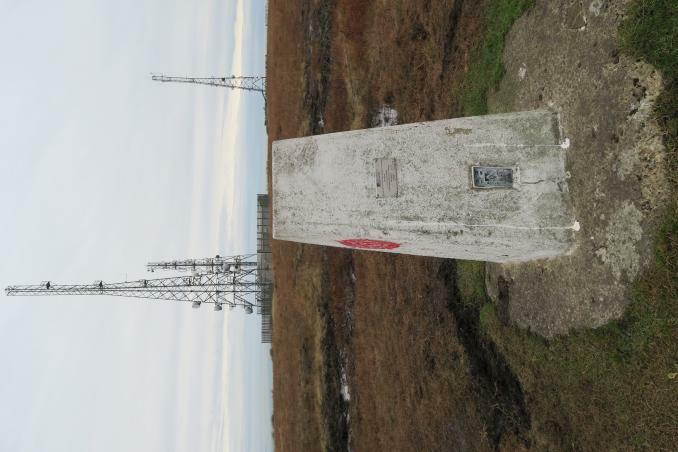 Trig in good condition, Clear and distant views. 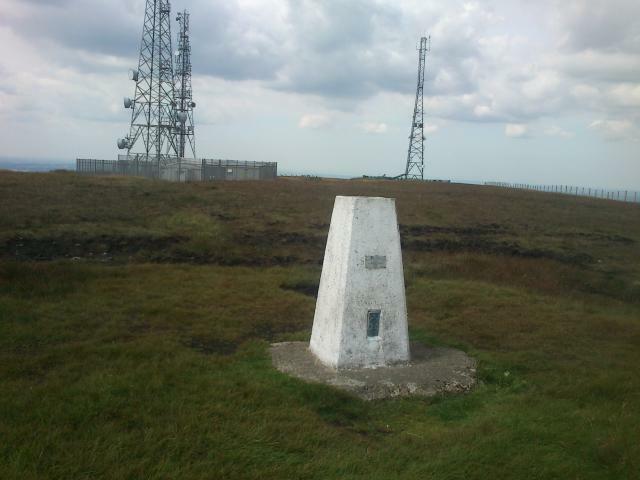 Absolute fantastic place to be, love walking up here, did it from Belmont. 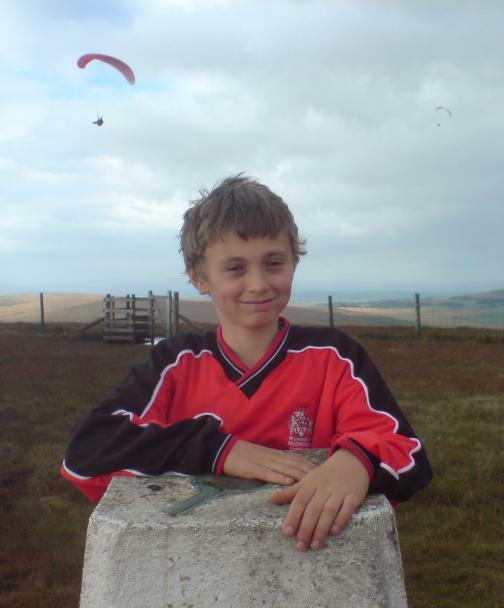 Not my first time up here. 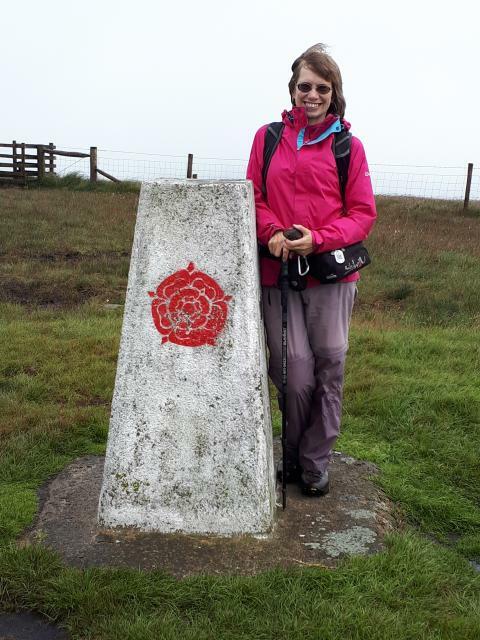 Walked up from Horden Stoops, via the right hand (not quite so boggy) path. 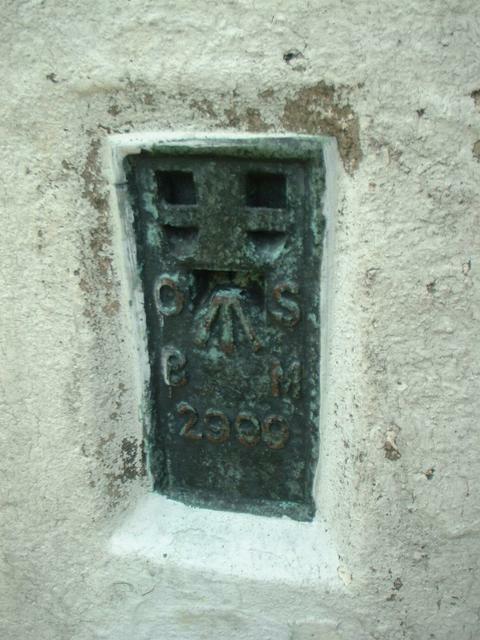 Carried on past the memorial and round via the gardens. 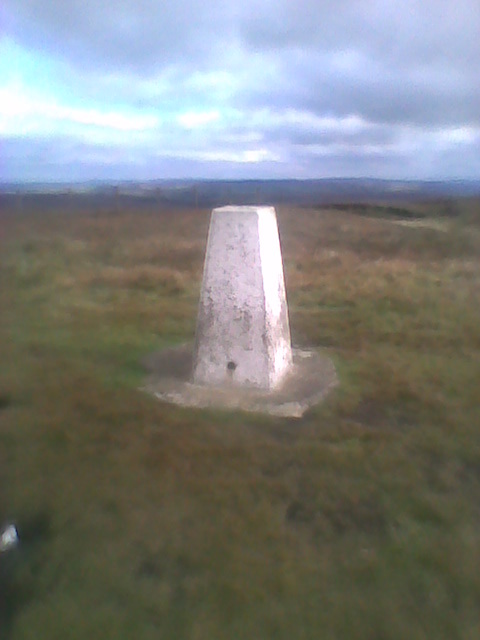 Good views, very boggy, managed to get rid of the Bolton Wanderers graffiti off the trig. A nicely graded ascent from Belmont. Distant views excellent - pity about the nearer ones. 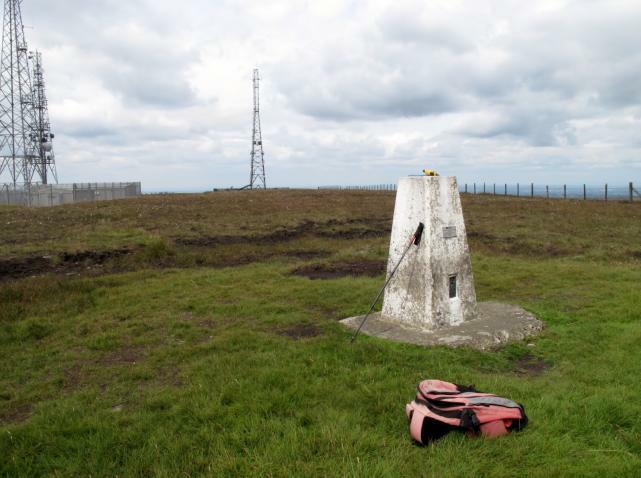 park in lay-by near s/block at hodern stoops, good walk up to the trig, ua top of blackburn and a few hundred meters further on is ua top of bolton. Didn't need directions to this one - just point your feet to the big stick on the top! 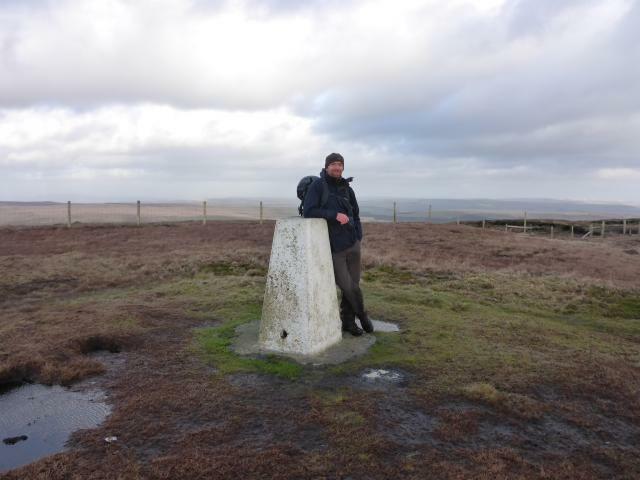 Great stiff walk up to the top (little wet under foot) with excellent views in all directions. Ribble estuary quite clear. 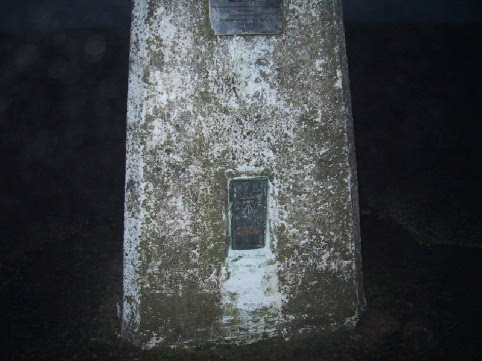 Drove right past it - have walked the long road before, and walked the Hordern Stoops way (the best way!). 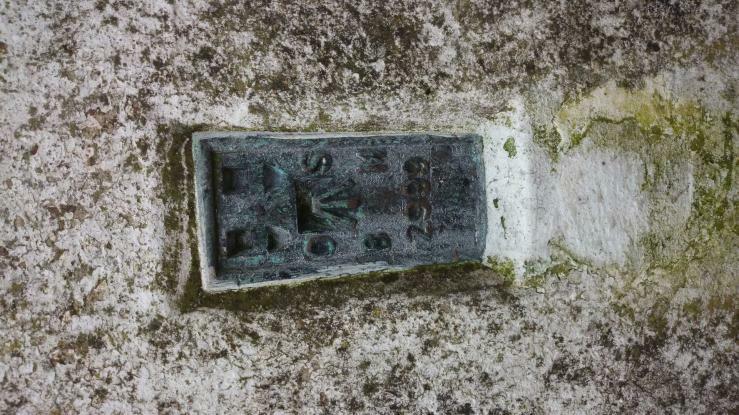 vgc, white, GPS plaque, asphalt plug. Grey day, barely below cloud, very little view. 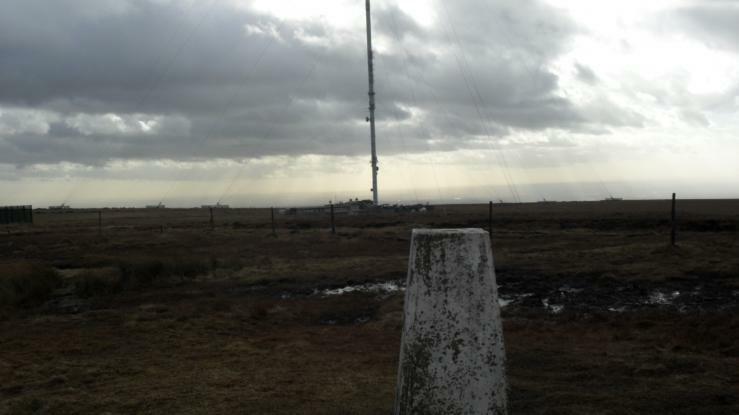 From SE, parked by gate, obeyed driving ban and jogged up mast access road. Last of the unprefixed Primaries, then. Looks pristine with its new coat of paint. 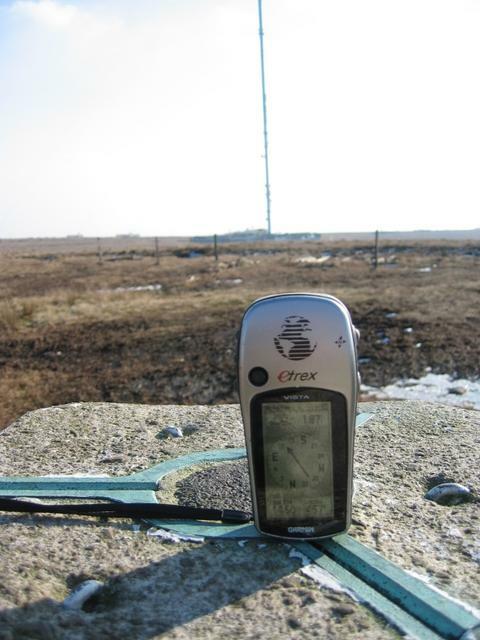 Trig sits in a boggy area close by the telecomms ironmongery. 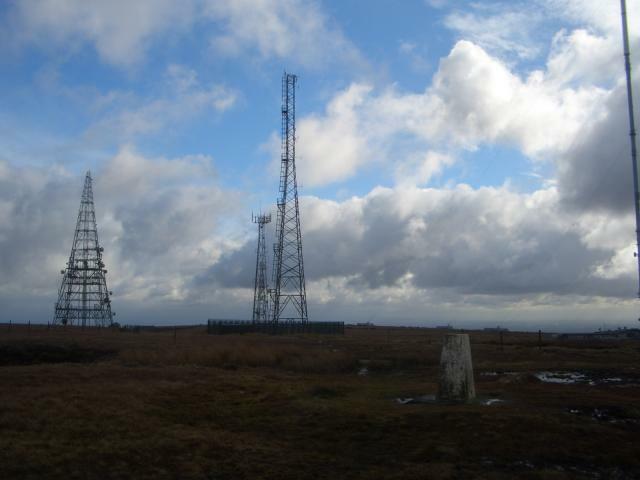 Rivington (Winter Hill) View S towards Winter Hill mast. 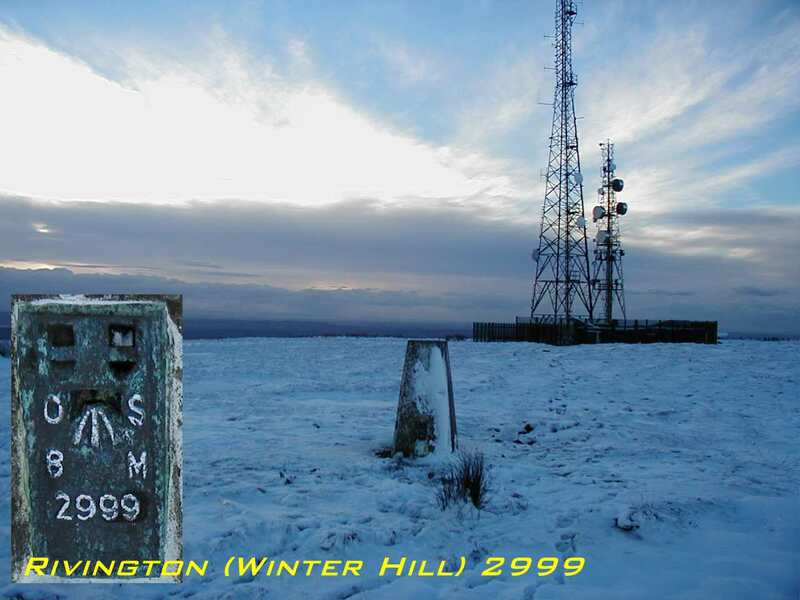 Winter Hill. 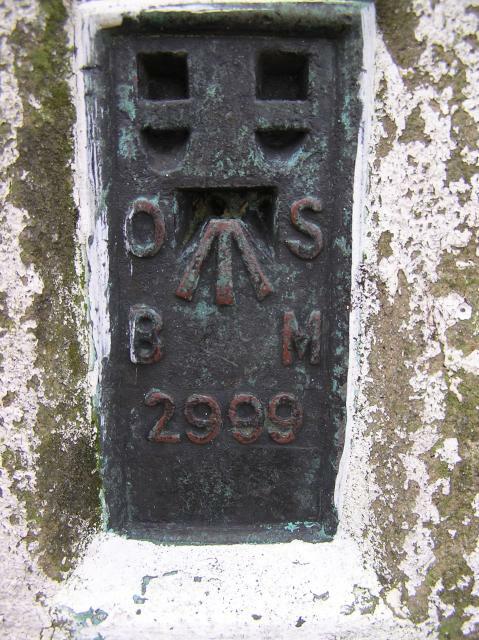 GPS plaque; Tarmac plug; recently painted, vgc. Top of the 'no S-prefix' series. 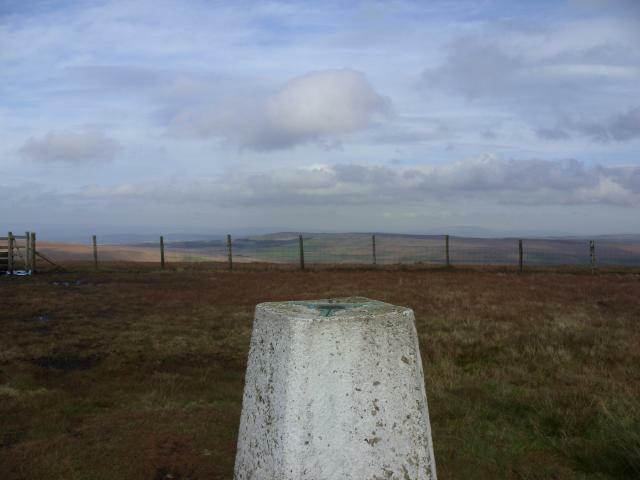 Extensive views with (I think) Stoodley Pike in the far distance looking east. 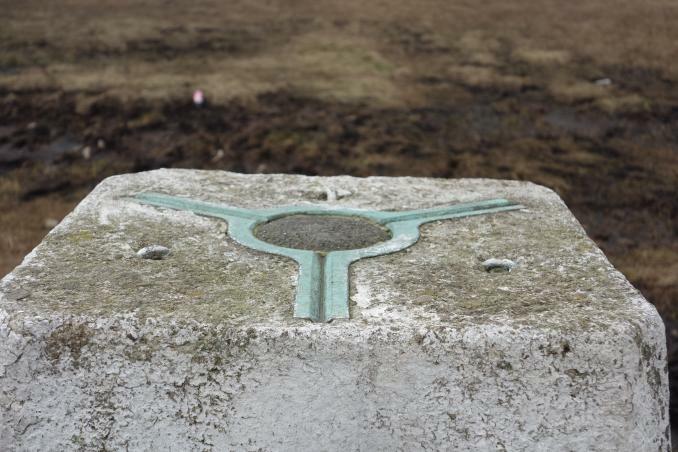 A short way S from the main mast is a tapered concrete pillar somewhat shorter than a trig but otherwise similar dimensions; metal plate on two sides (no lettering) - perhaps marking an old shaft. 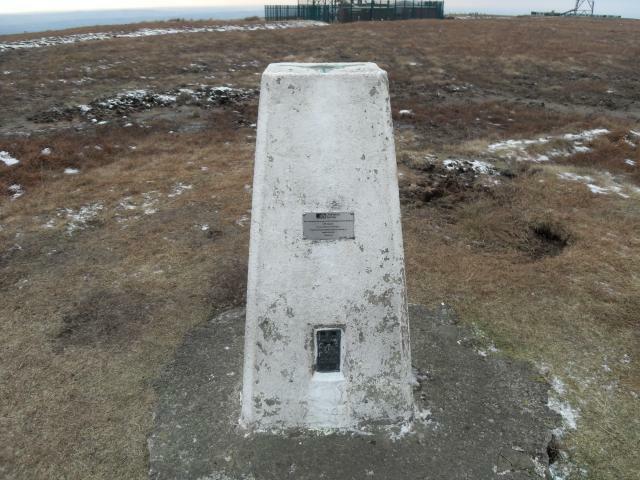 Nice walk up in sunshine past the 'Two Lads'. 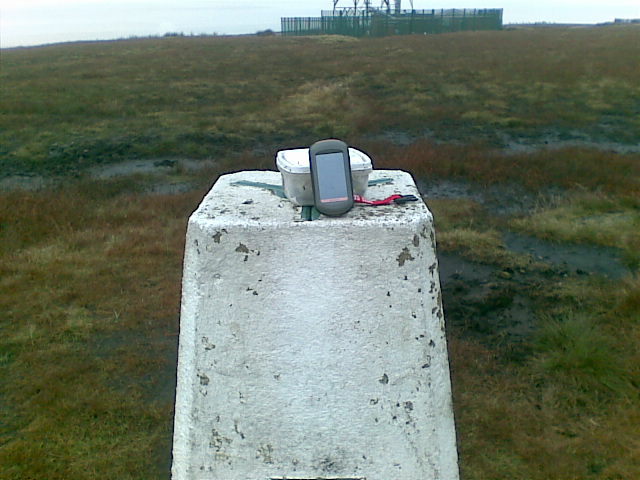 Has had a new coat of paint and GPS badge. 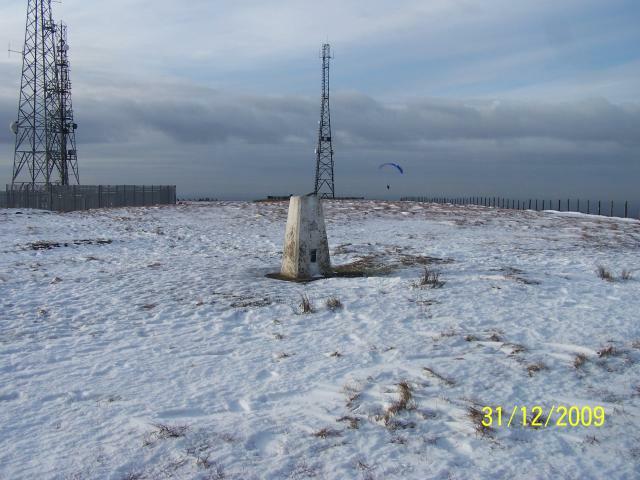 On top of winter hill. Nice easy drive up!! 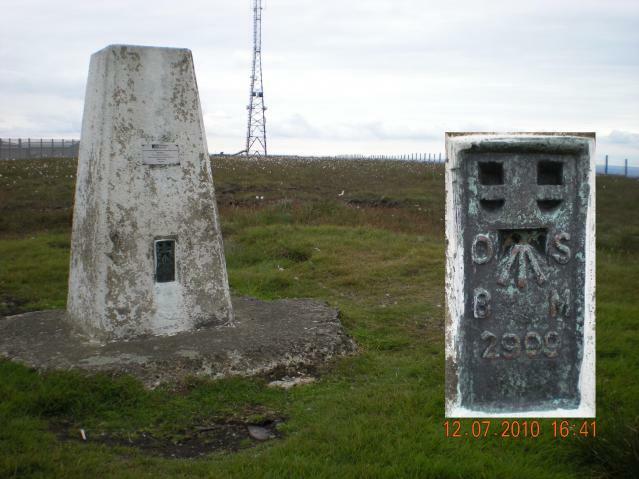 Parked by Horden Stoops Surface Block trig and walked up following the wall to the base of Winter Hill, then took to path to top. Excellent views. 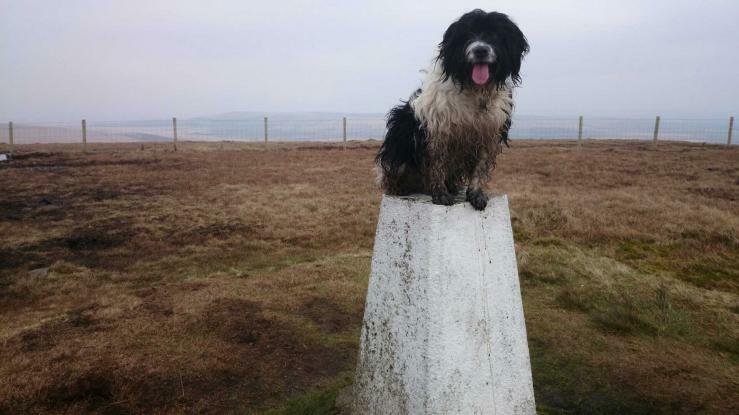 One of the oldies in the trig family. 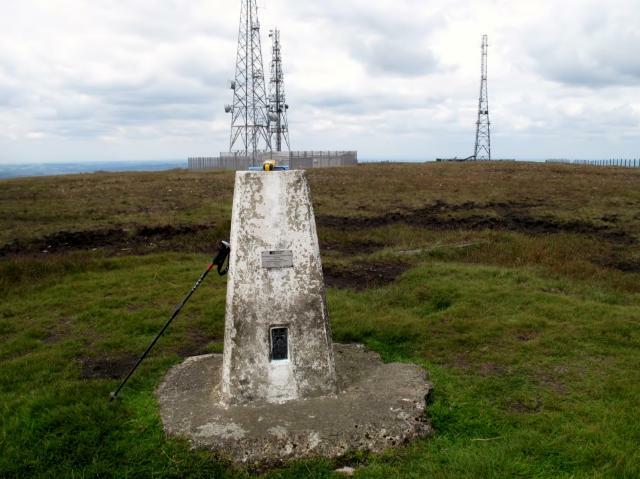 The top of the pillar with GPSr and Winter Hill TV behind Why is it called Rivington when it is on Winter Hill and nearer Belmont? Ascended the hill from Belmont in very wet conditions. The first July 1999 OS "tag" that I have come across. 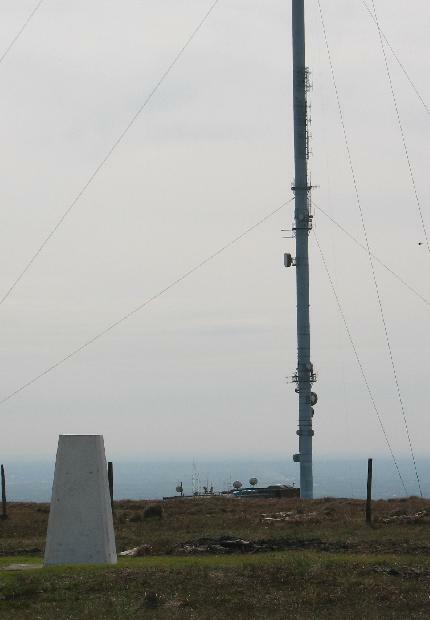 Surprising in view of the 8 masts that clutter up this particular hill. 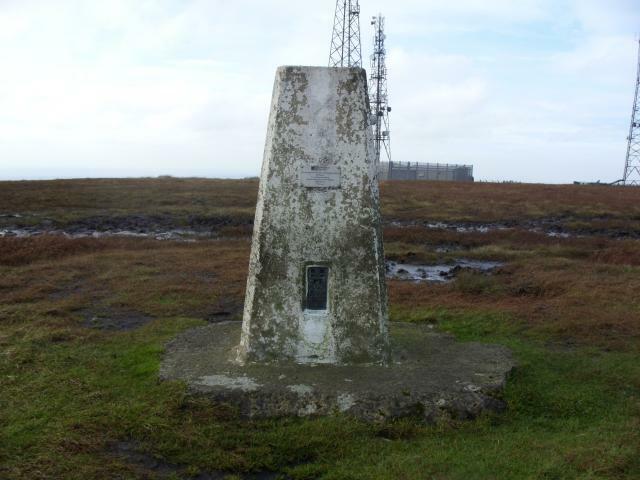 Staggered up Winter Hill after a run at Watergrove. 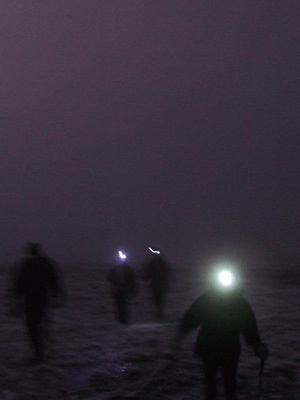 Pouring down, but the mist almost hid the masts. Direct descent to the Blue Lagoon was tussock hell, rather fun. 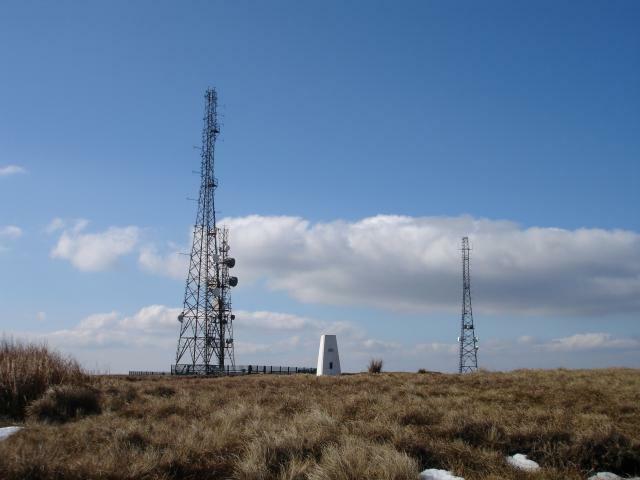 Winter Hill must have more masts than virtually antwhere in the country, although Alport Low in Derbyshire would come a close second.